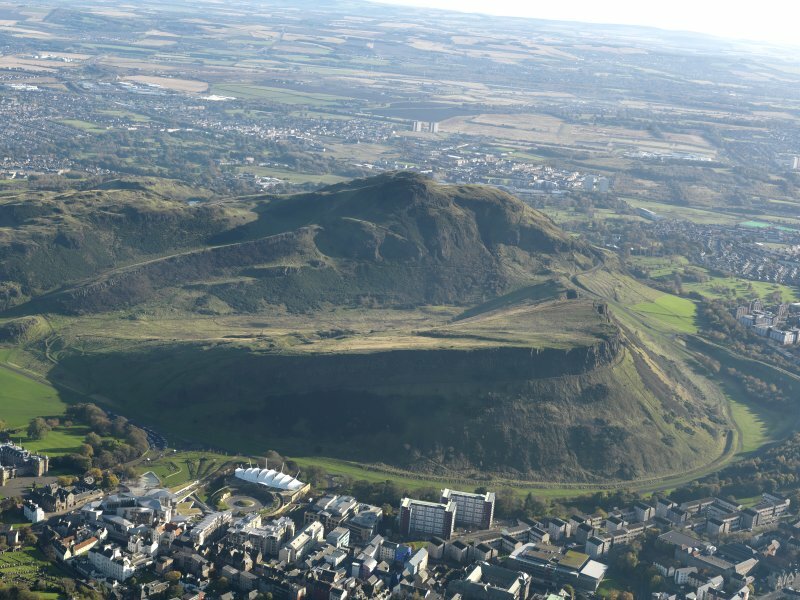 Oblique aerial view of Edinburgh, centred on Holyrood Park, taken from the SW.
Oblique aerial view of Edinburgh, centred on Holyrood Park, taken from the ENE. 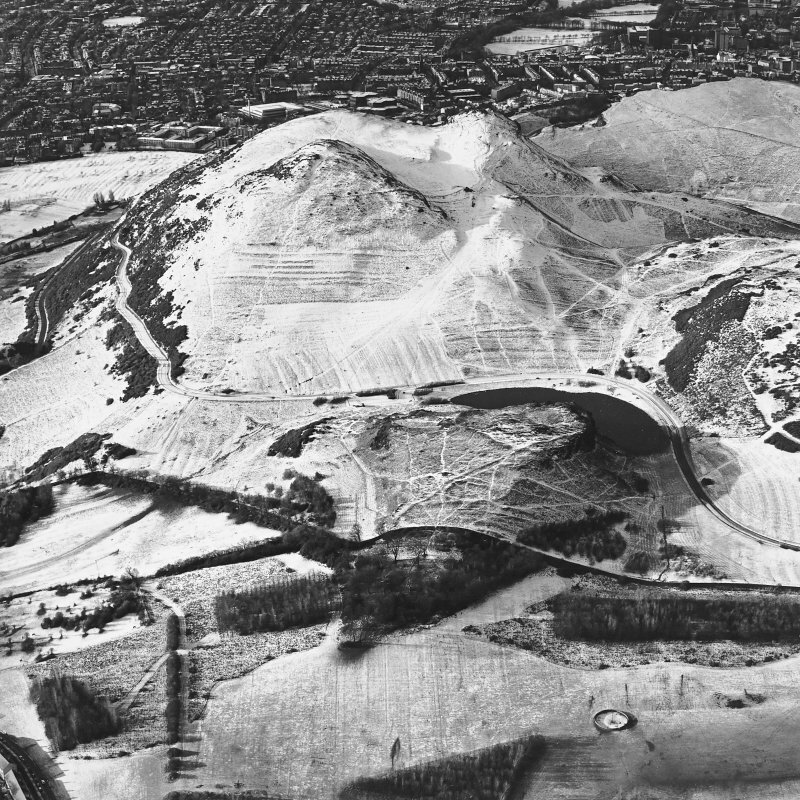 Oblique aerial view of Holyrood Park centred on the remains of cultivation terraces, a fort, rig and enclosures, taken from the ENE. 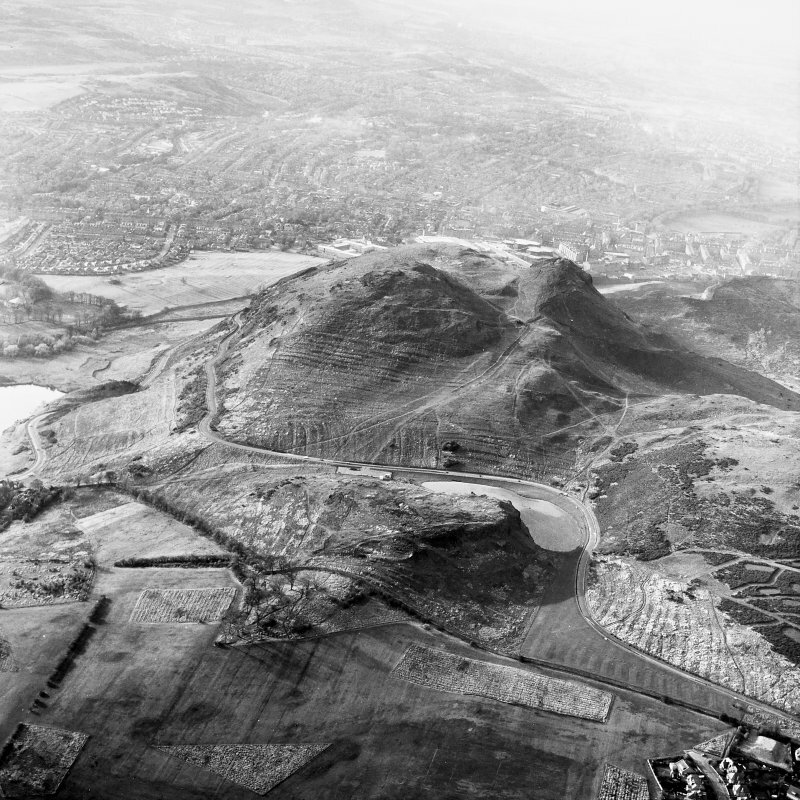 Oblique aerial view of Edinburgh, centred on Holyrood Park, taken from the SE. 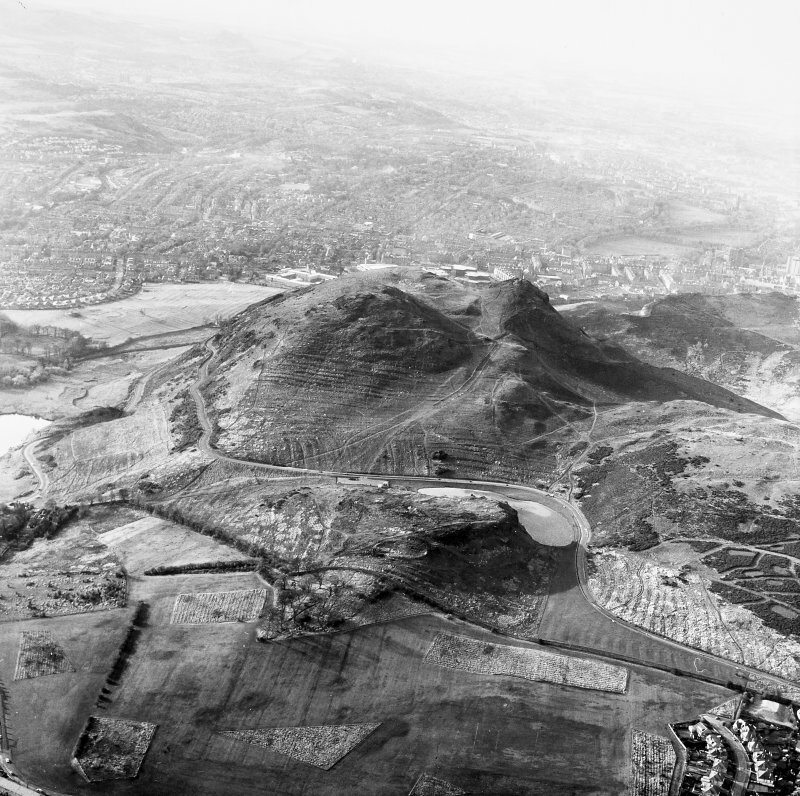 General oblique aerial view of the cultivation terraces and the remains of the fort on Arthur's Seat and Dunsapie, taken from the NE. 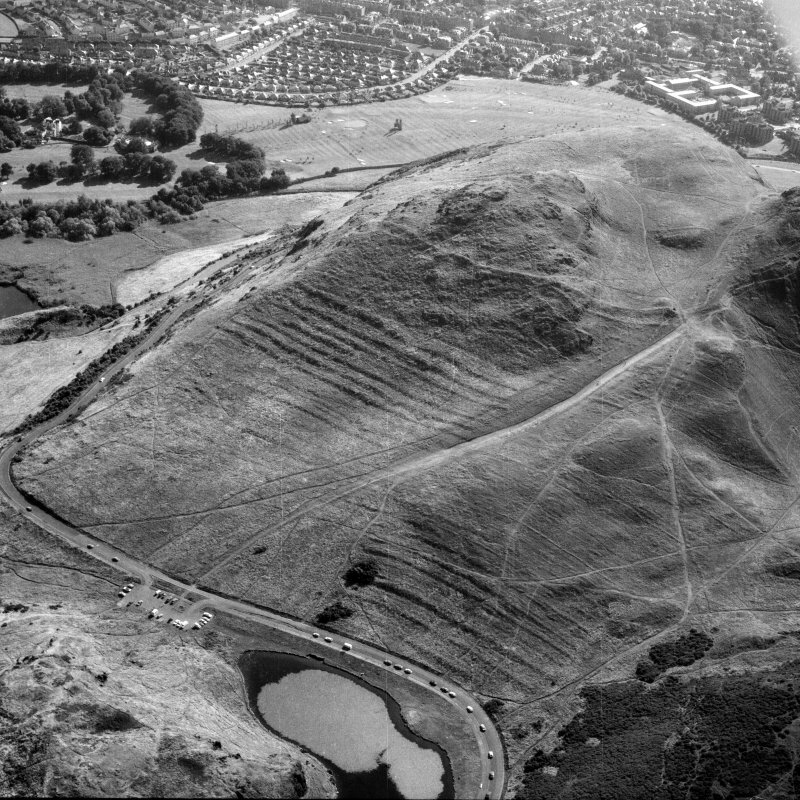 Arthur's Seat. 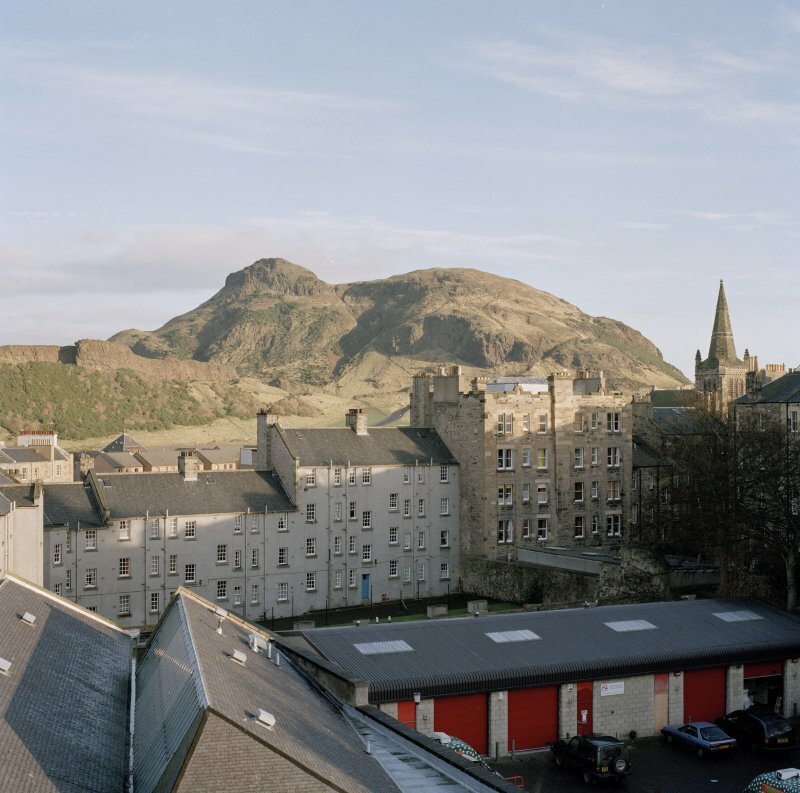 View from John Sinclair House, 16 Bernard Terrace from West. 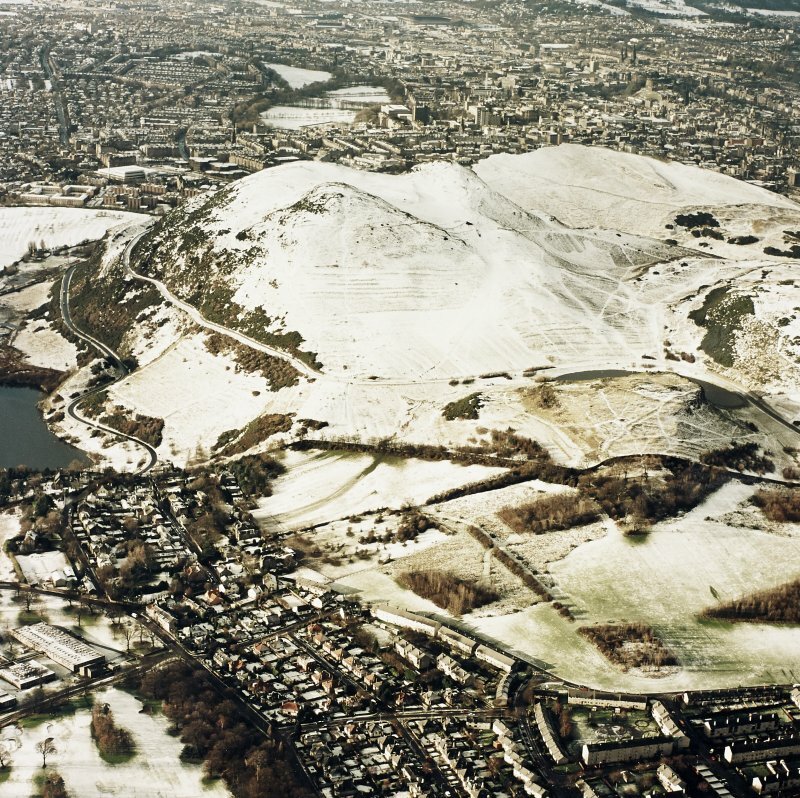 Oblique aerial view of Edinburgh, centred on Holyrood Park, taken from the NE. 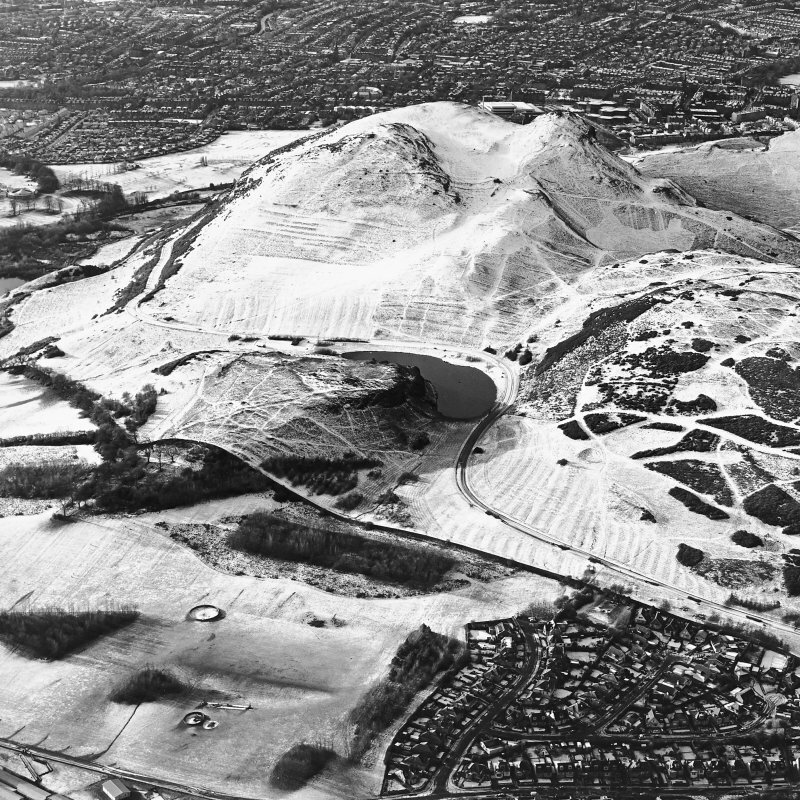 Oblique aerial view of Holyrood Park centred on Arthur's Seat with the remains of quarries on Salisbury Crags and cultivation remains in front, taken from the SW.
Oblique aerial view of Holyrood Park centred on the remains of cultivation terraces on the slopes of Arthur's Seat with Dunsapie Hill adjacent, taken from the ESE. 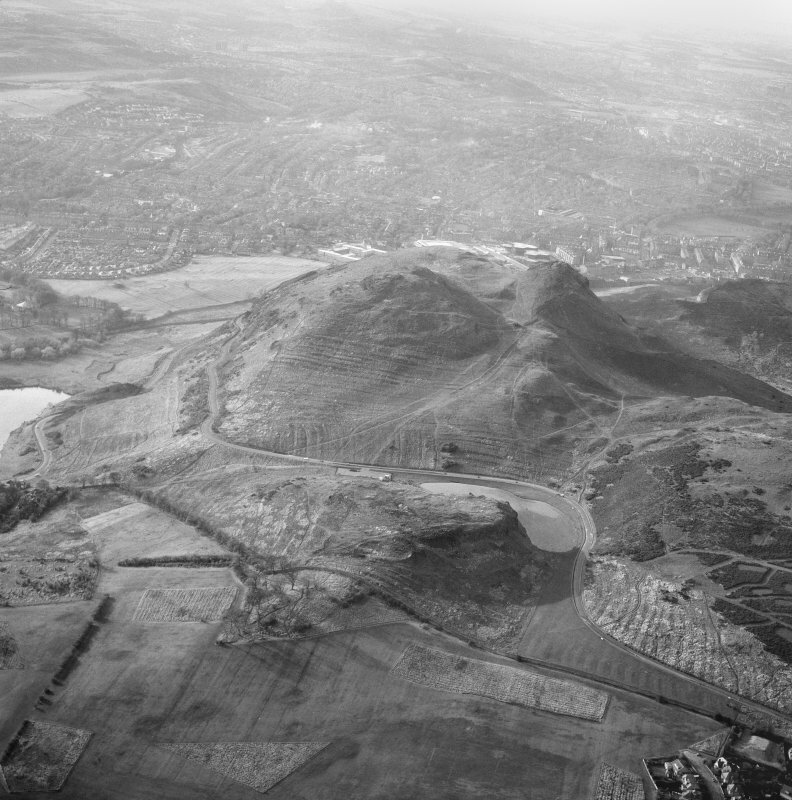 Oblique aerial view of Edinburgh, centred on Holyrood Park, taken from the NNW. 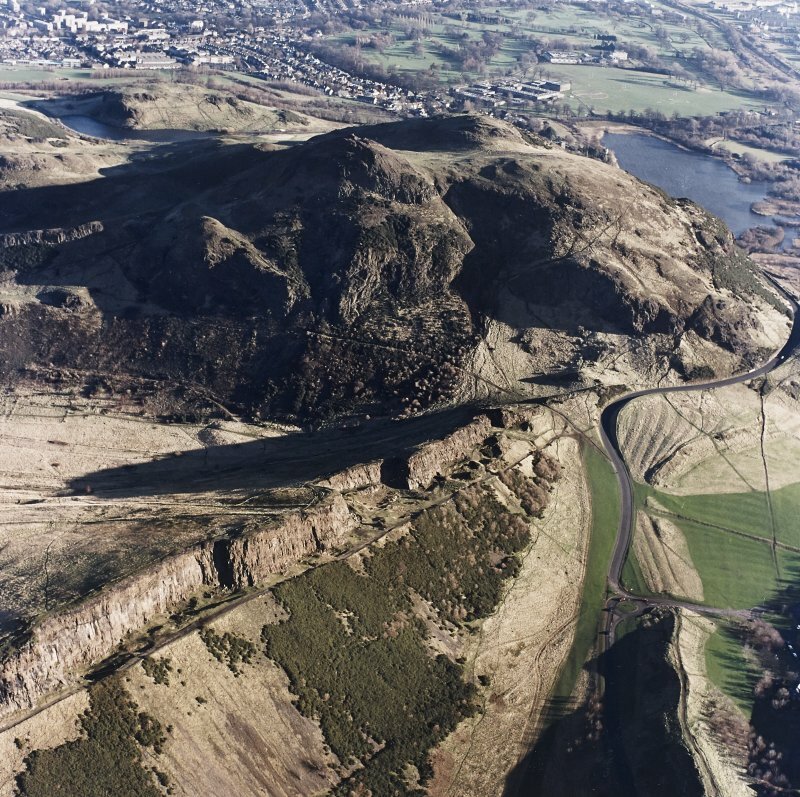 General oblique aerial view looking across Salisbury Crags towards Arthur's Seat, taken from the NW. 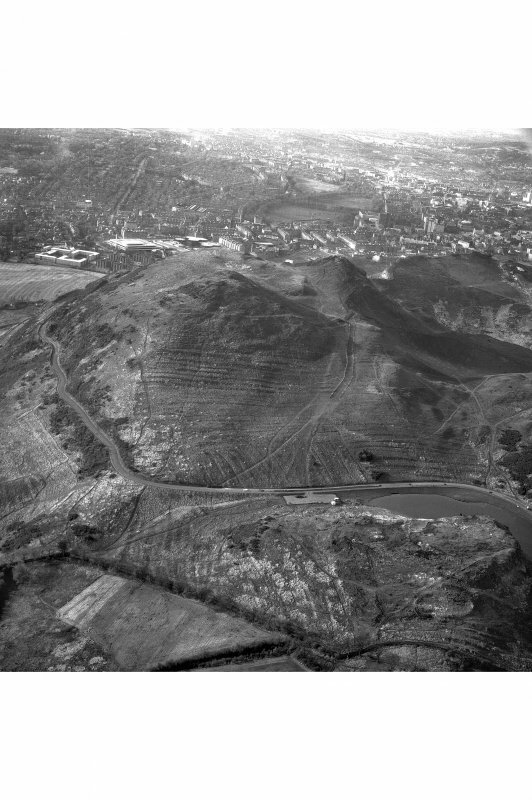 Oblique aerial view of Holyrood Park centred on the remains of cultivation terraces, taken from the SE. 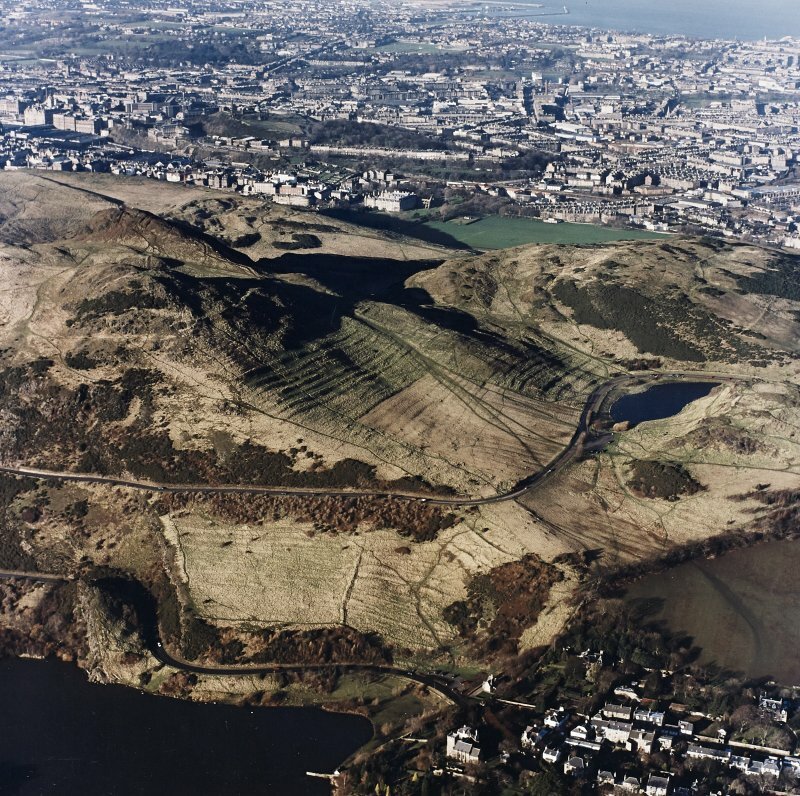 Oblique aerial view of Edinburgh, centred on Holyrood Park, taken from the E.
Oblique aerial view of Edinburgh, Holyrood Park centred on the remains of cultivation terraces, taken from the SE. 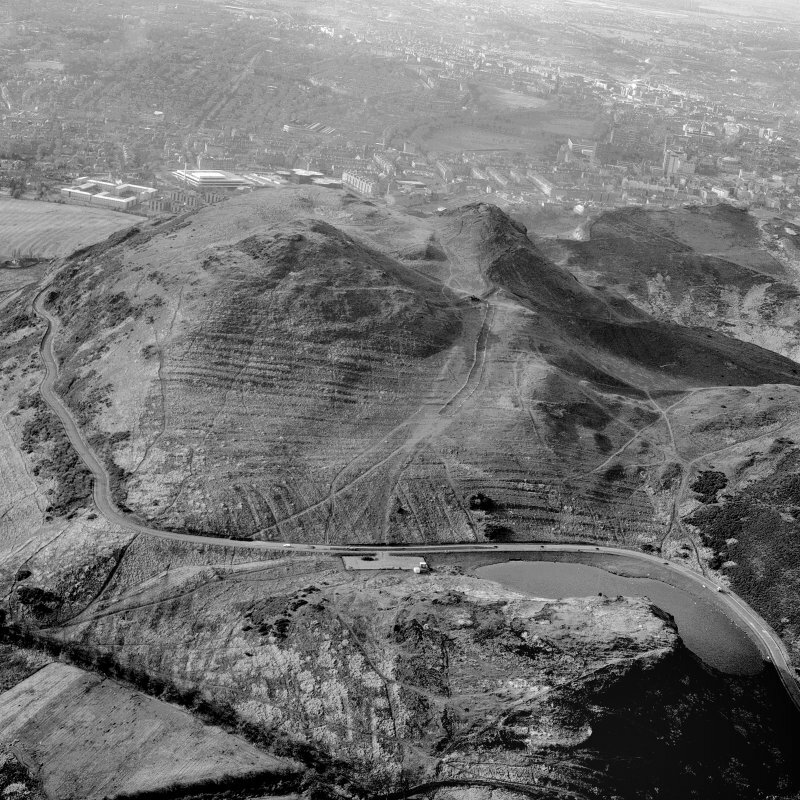 Oblique aerial view of Holyrood Park centred on the remains of cultivation terraces and rig, taken from the SE. 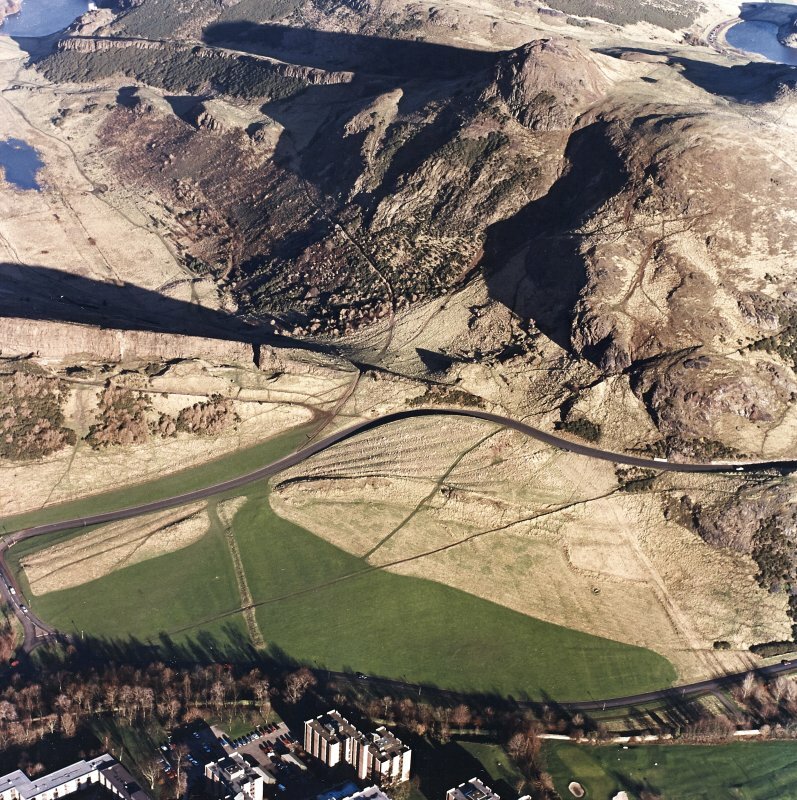 Oblique aerial view of the cultivation terraces and the remains of the fort on Arthur's Seat, taken from the ENE. 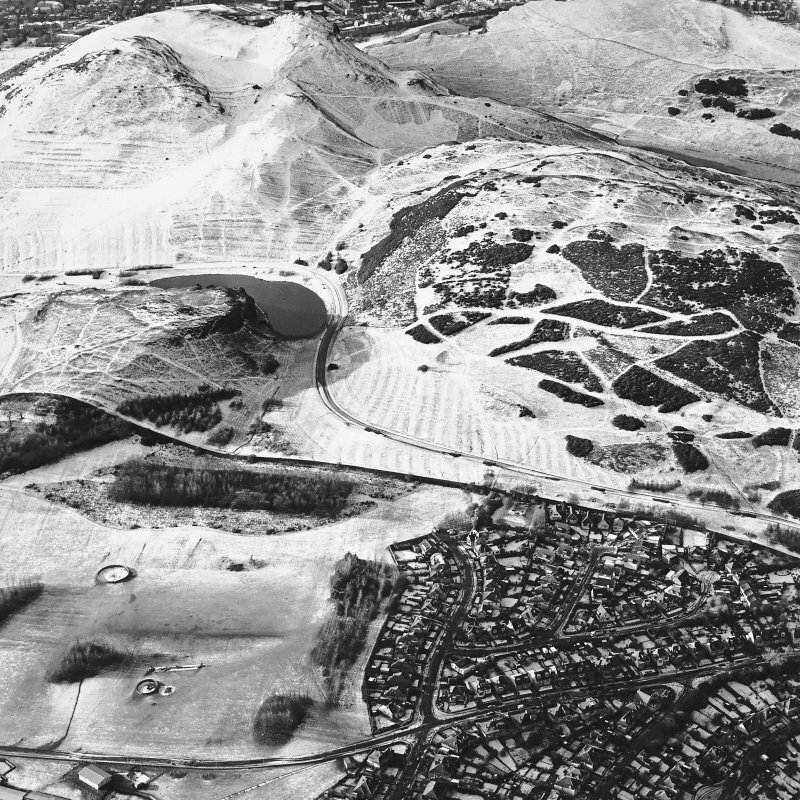 Oblique aerial view of the cultivation terraces and the remains of the fort on Arthur's Seat, taken from the E.
Oblique aerial view of Edinburgh, Holyrood Park centred on the remains of cultivation terraces, taken from the ESE. 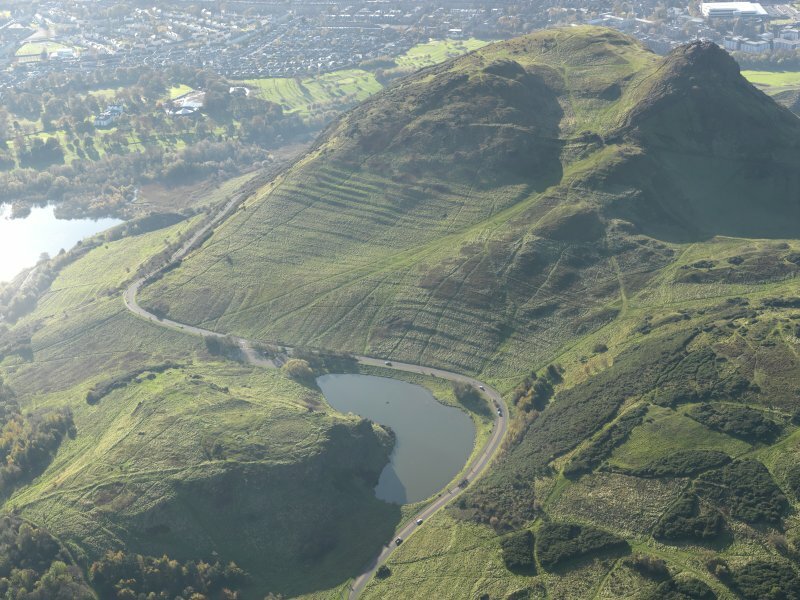 Oblique aerial view of Edinburgh, centred on Holyrood Park, taken from the ESE. 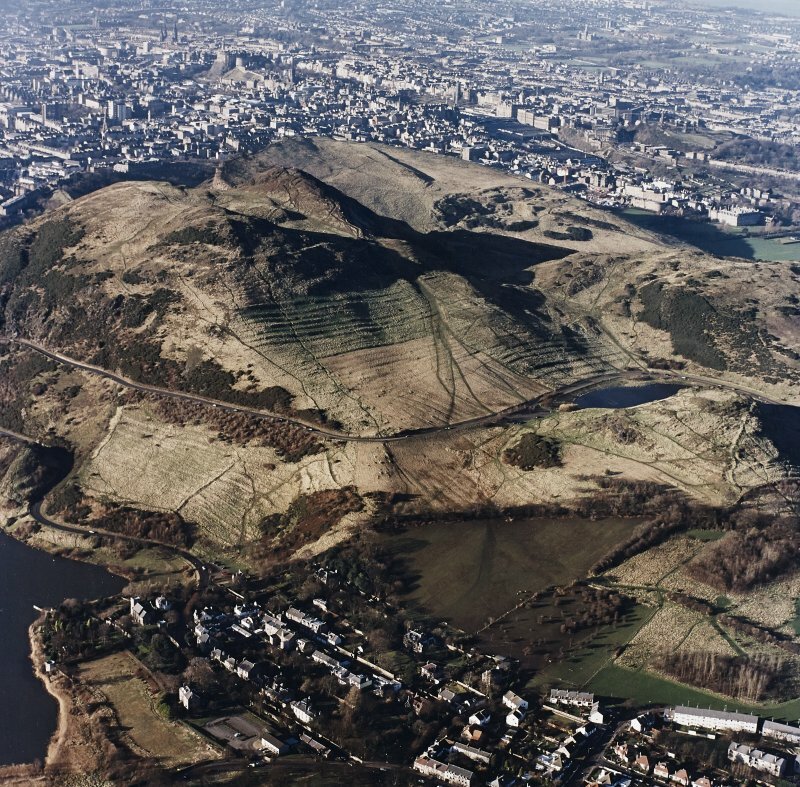 Oblique aerial view of Edinburgh, centred on Holyrood Park, taken from the S.
Oblique aerial view of Holyrood Park centred on the remains of quarries on Salisbury Crags with Arthur's Seat behind, taken from the WSW. 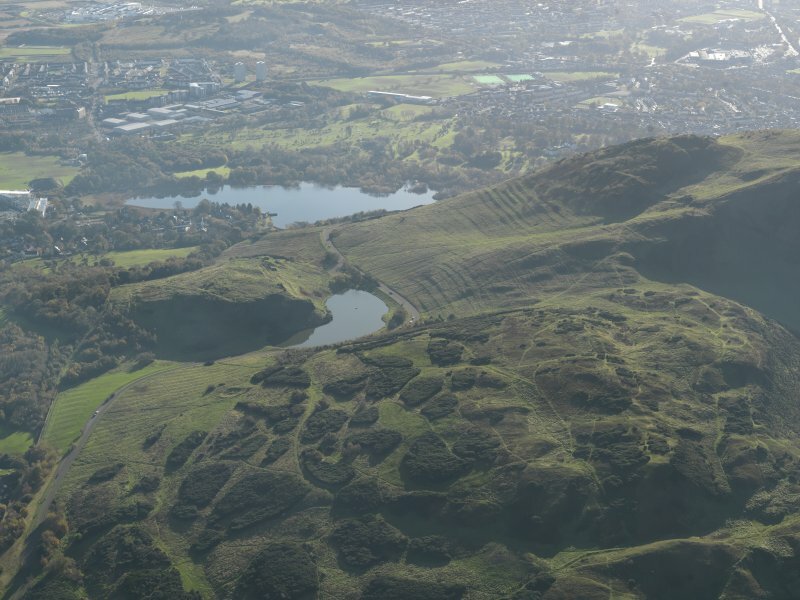 Oblique aerial view of Edinburgh, centred on Holyrood Park, taken from the NNE. 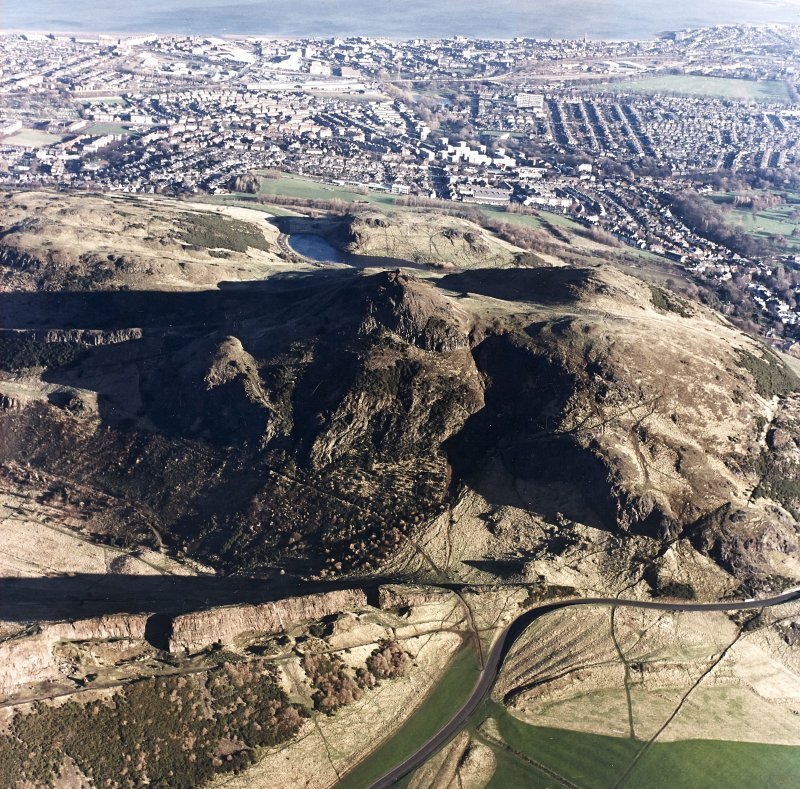 Oblique aerial view of Edinburgh, centred on Holyrood Park, taken from the SSE. 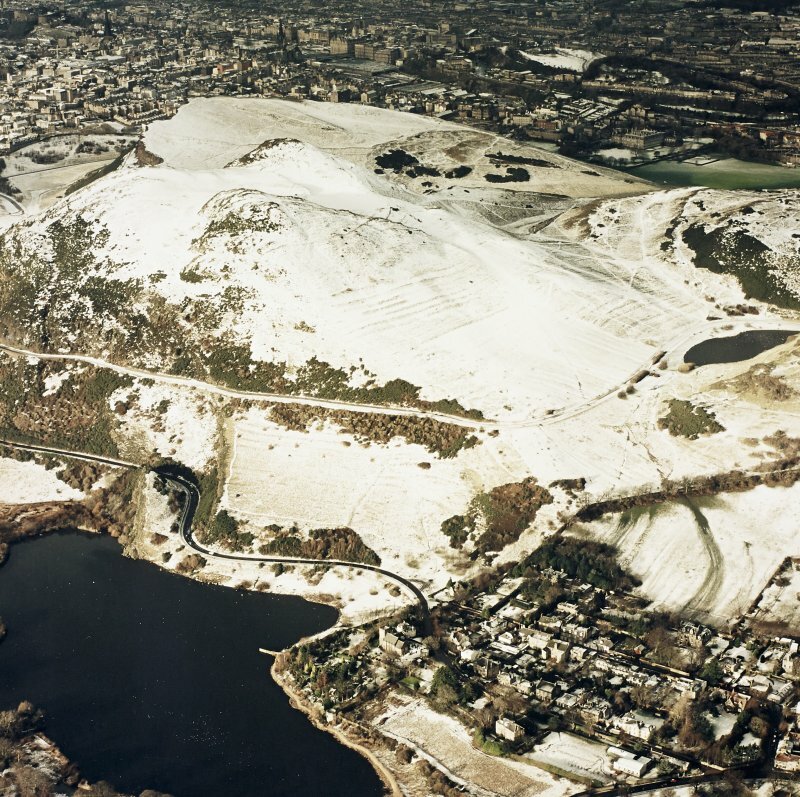 Oblique aerial view of Holyrood Park centred on the remains of cultivation with Arthur's Seat behind, taken from the SW.
Oblique aerial view of Edinburgh, centred on Holyrood Park, taken from the SSW. 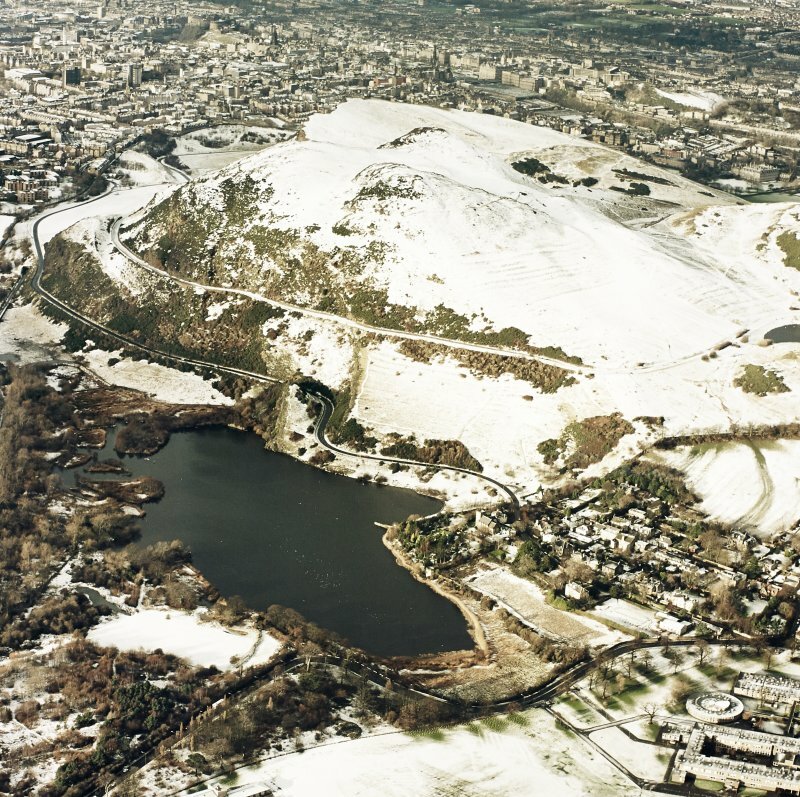 Oblique aerial view of Holyrood Park centred on Arthur's Seat, taken from the SE. 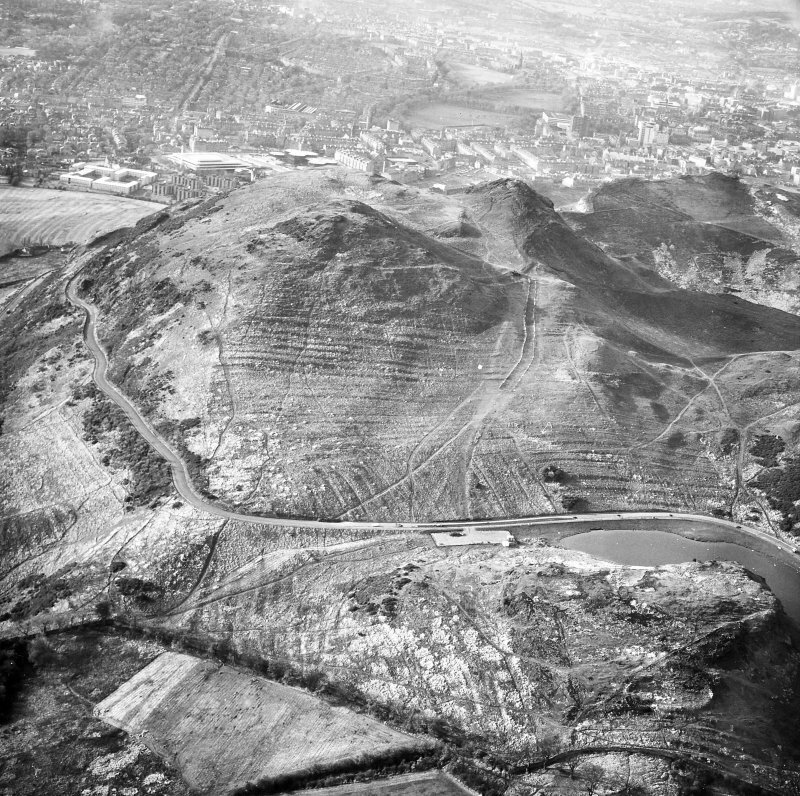 Oblique aerial view of Holyrood Park centred on Arthur's Seat with the remains of cultivation in front, taken from the SW.
Oblique aerial view of Holyrood Park centred on the remains of cultivation terraces and an enclosure, taken from the E.
Oblique aerial view of the cultivation terraces and the remains of the fort on Arthur's Seat, taken from the NE. 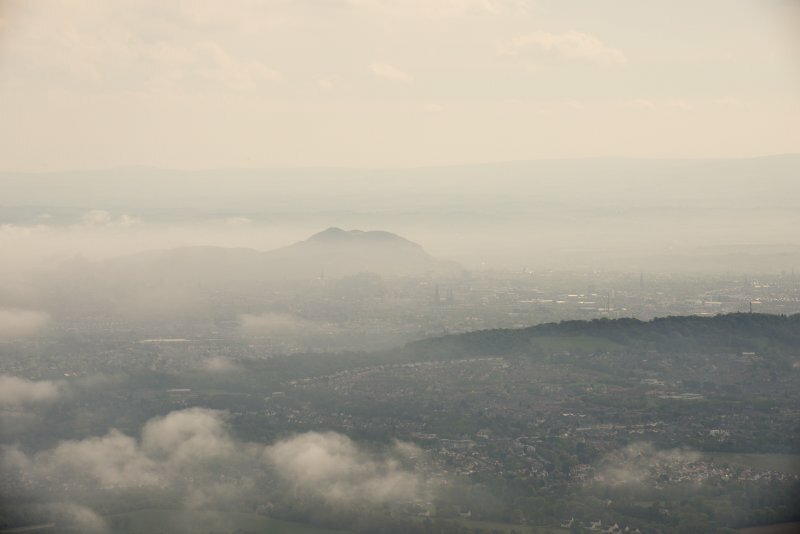 See also NT27SE 251, NT27SE 252, NT27SE 3959. See also under general views (NT27SE 197). 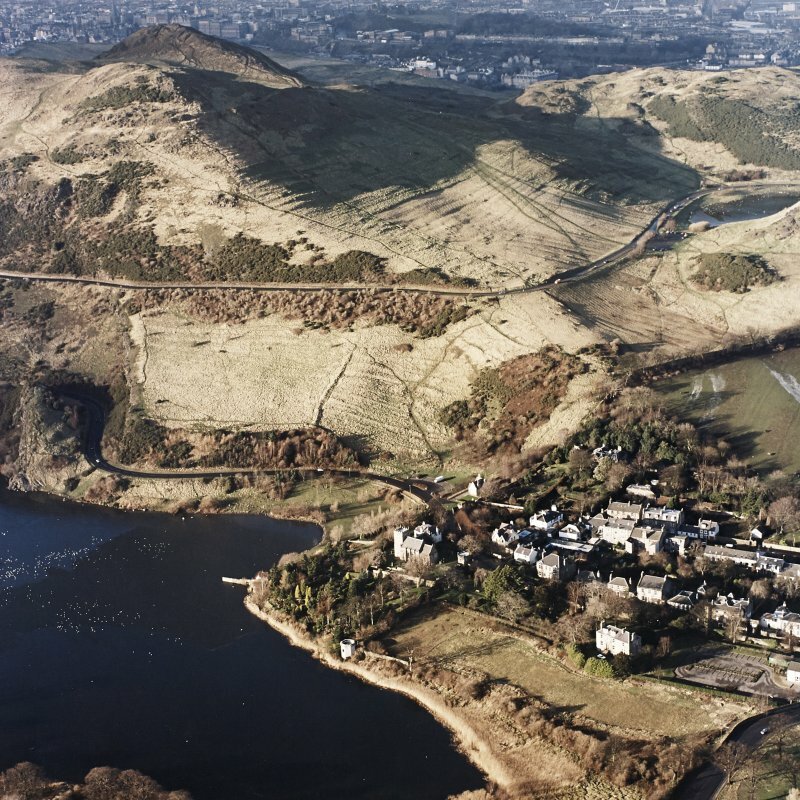 A fort, some 20 acres in extent, occupies the summit of Arthur's Seat, the subsidiary summit, Crow Hill, also being incorporated. 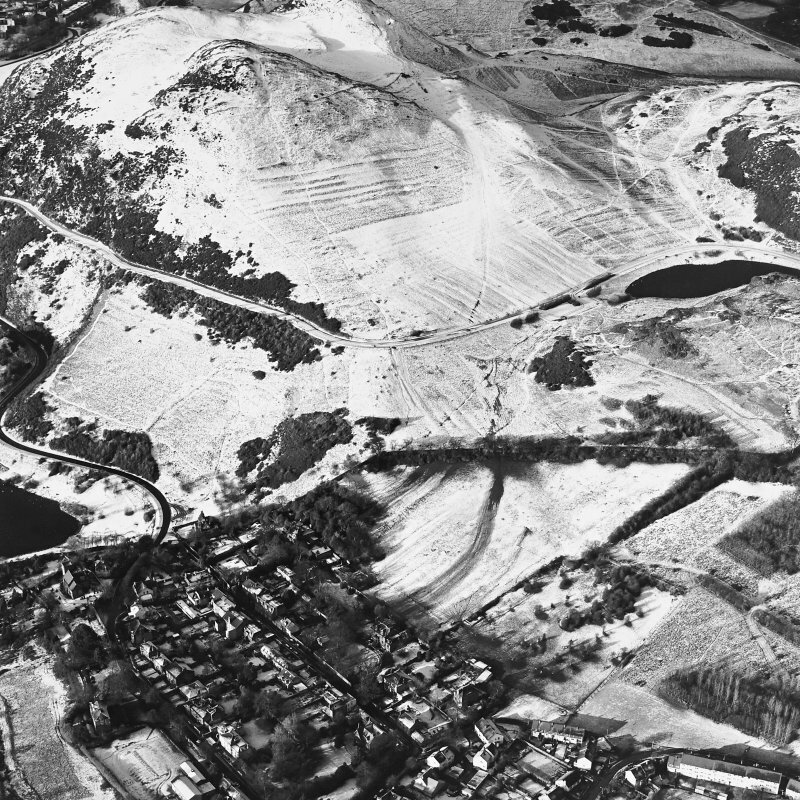 Three parts of the perimeter are bordered only by the steep flanks of the hill, although some defences may well originally have followed at least some of this line. 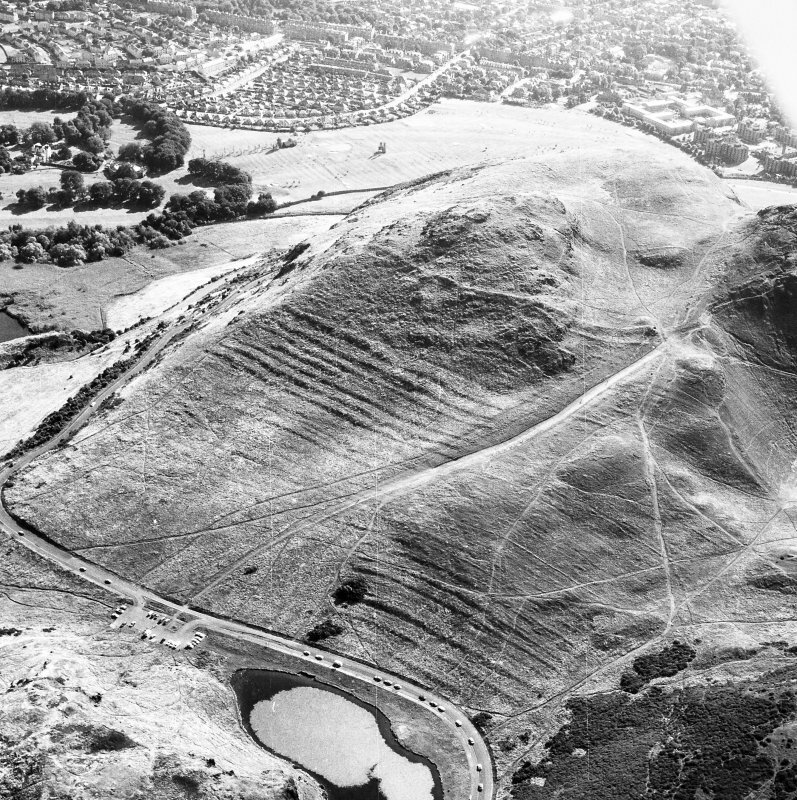 The only easy approach, from the E, is blocked by the ruins of two formidable stone walls, 375 yards long, the best preserved parts lying S of the path leading to the peak, on the flank of Crow Hill. Immediately S of the path, and W of this region, later enclosures have obscured the lines of the walls and penetrated into the interior of the fort. 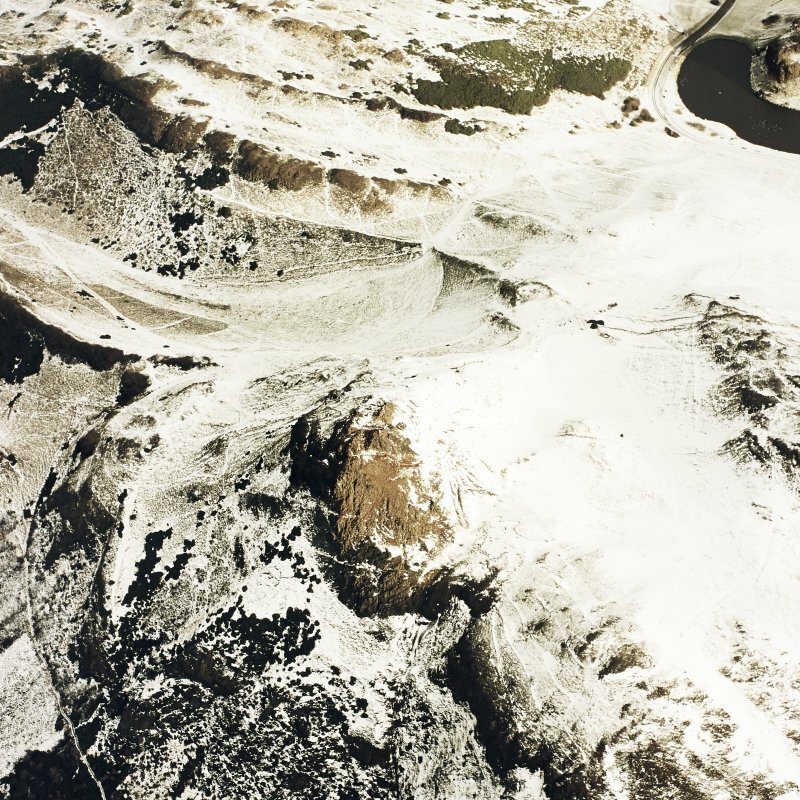 No traces of dwellings exist within the fort, but this area has all been ploughed, so any remains of either timber-framed or stone-built houses which may have existed, have been obliterated. 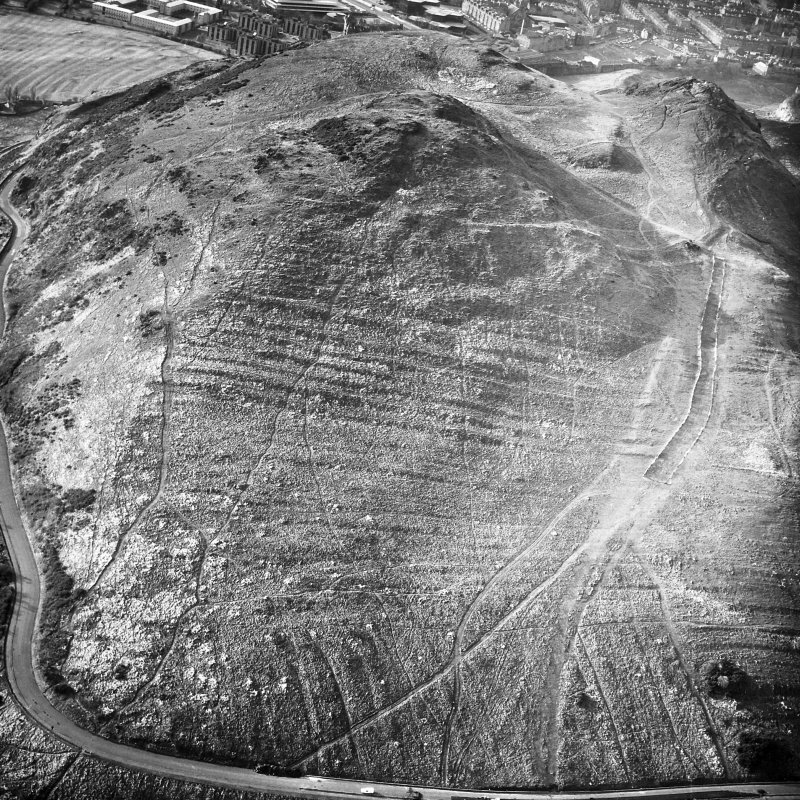 Feachem (1965) suggests that the 'hill-top may have been occupied in pre-Roman times, if not later' while Stevenson, by analogy with the outer works of Dalmahoy fort (NT16NW 1) tentatively suggests a Dark Age date. 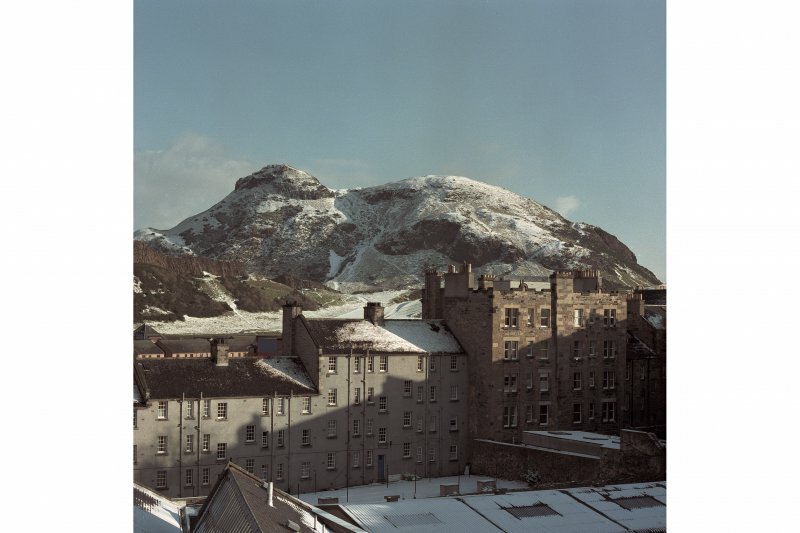 R B K Stevenson 1949; RCAHMS 1951; R W Feachem 1963; 1965. Centred NT 2770 7298. 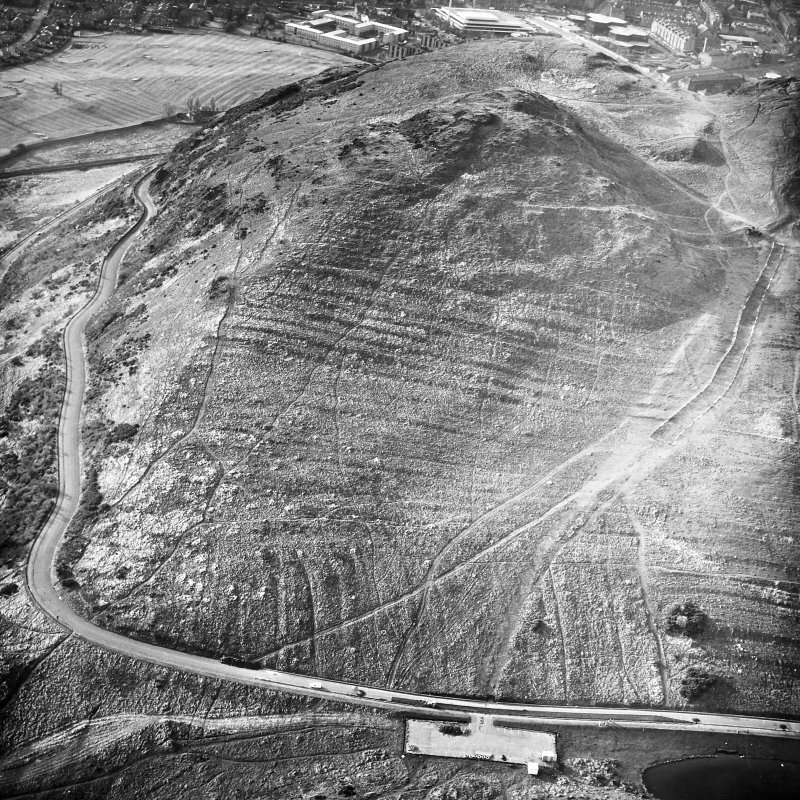 Situated on a saddle some 150m E of the summit are the scanty remains of a fort generally as described by previous information. 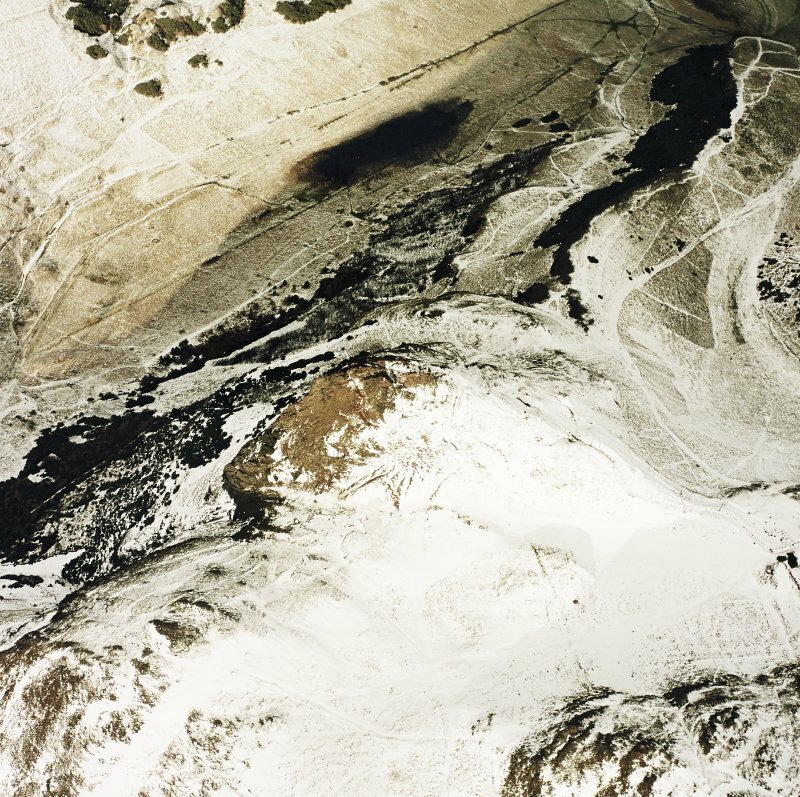 Visited by OS (S F S) 8 December 1975. 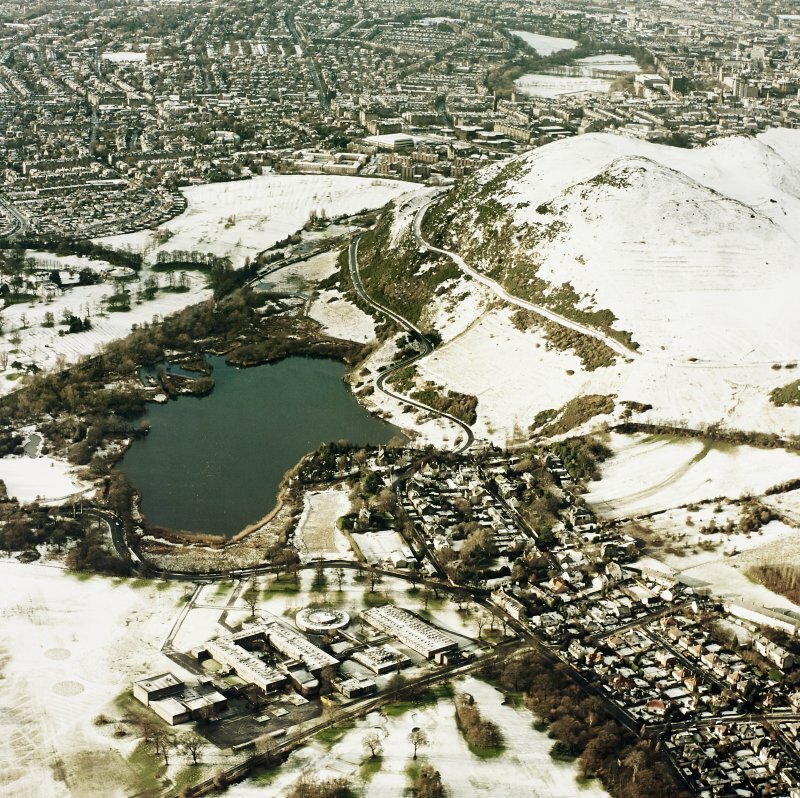 Scheduled as part of Holyrood Abbey, Palace Gardens and Park (December 1994). (Undated) information from Historic Scotland. NT 276 729. 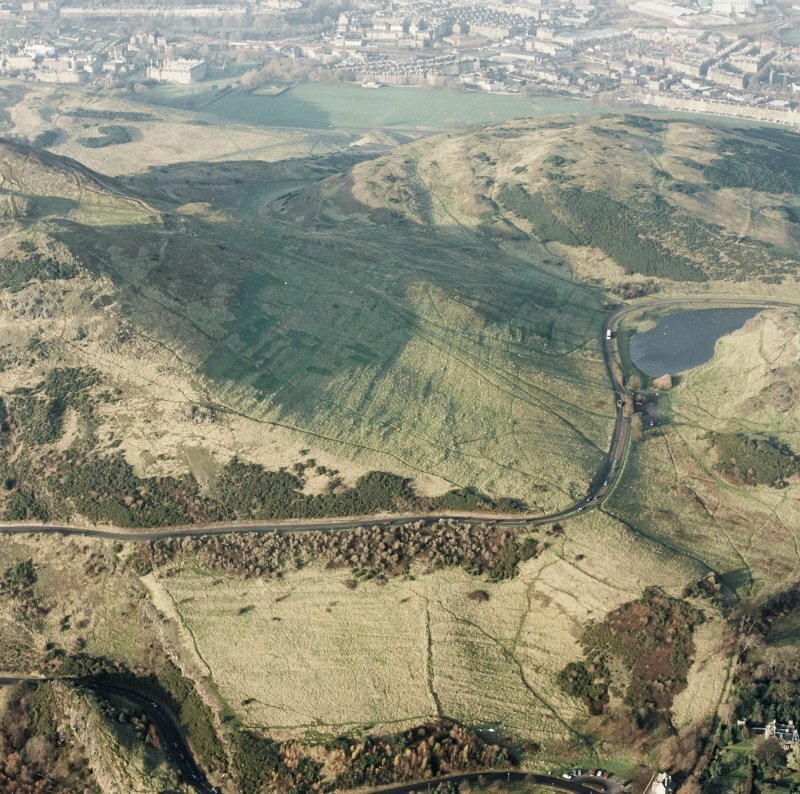 Excavation was undertaken in advance of the proposed construction of a length of stone-pitched path on the eastern approaches to the summit of Arthur's Seat. 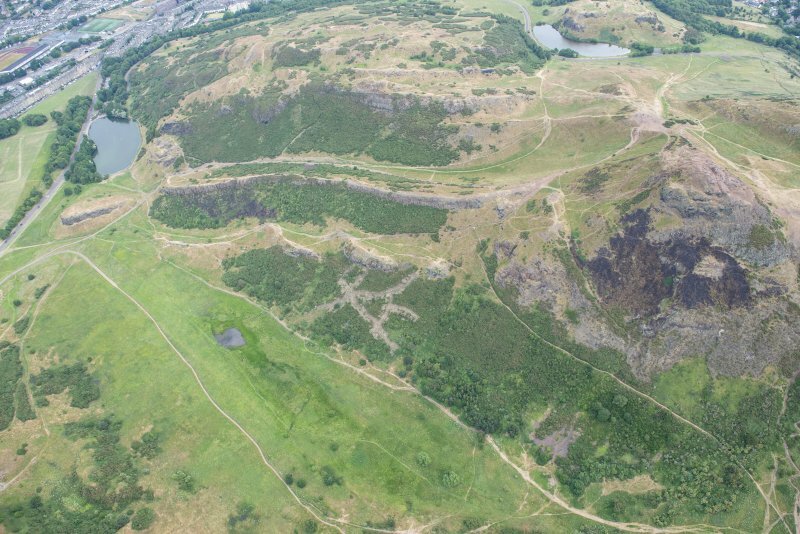 This path is to run inside the area enclosed by two ramparts which have been previously suggested as being Early Historic in date by R B K Stevenson. 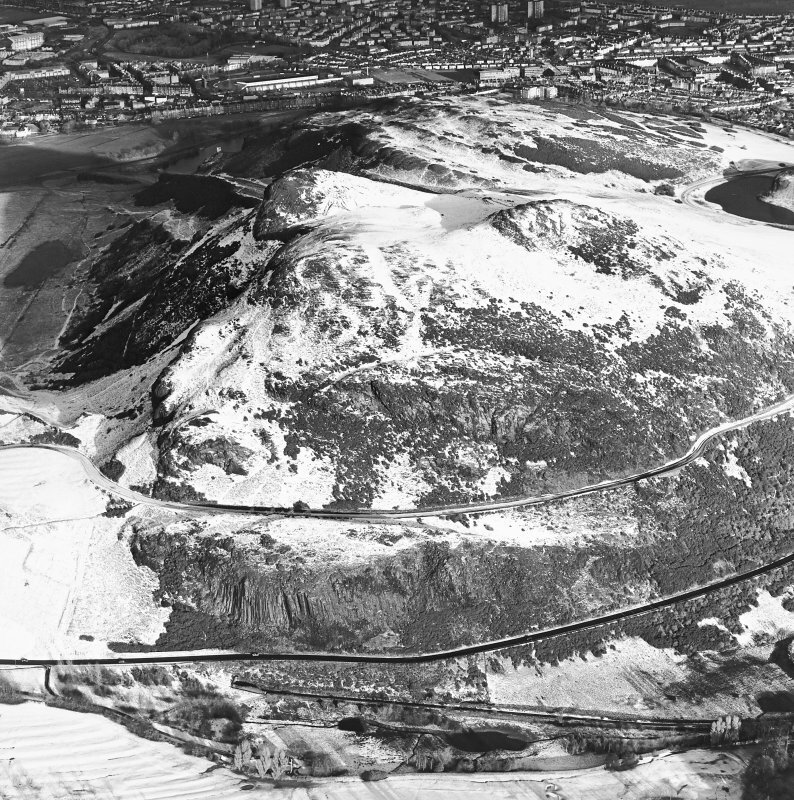 The investigation comprised the excavation in January 1995 of seven closely-spaced trenches along the length of the proposed new path, the lower end of which ran along the inside of the inner rampart. An eighth trench was excavated through the rampart to examine its structure and provide a possible date for its construction. In the trenches adjacent to the rampart, the rubble core was exposed. 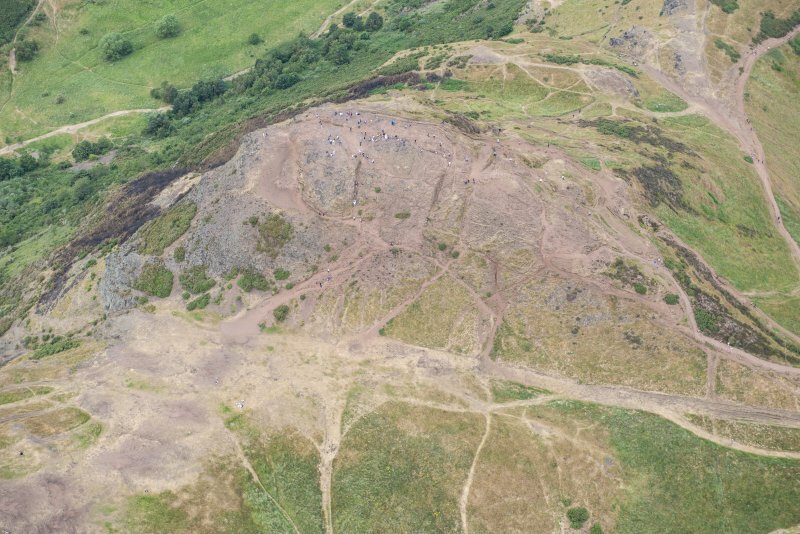 The trench through the rampart revealed that the rubble forming the rampart core was at least 1.2m high. 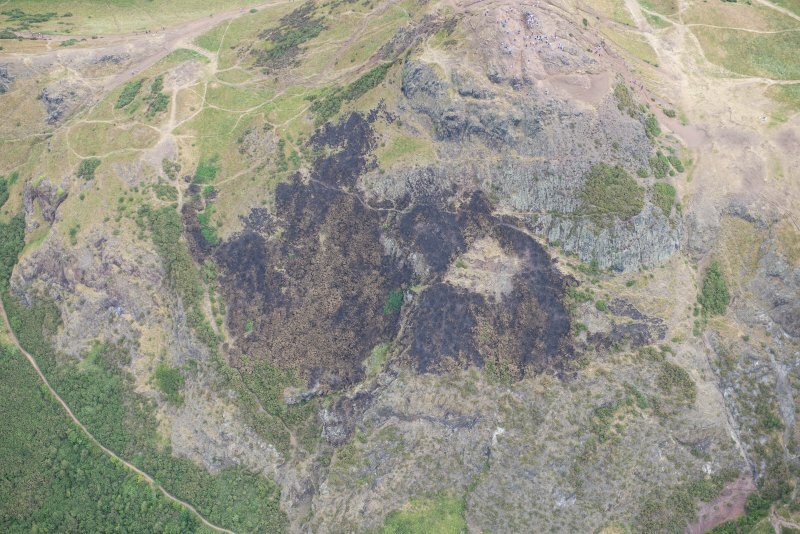 A possible collapsed outer wall face was located, making the exposed section of rampart at least 5.4m wide. 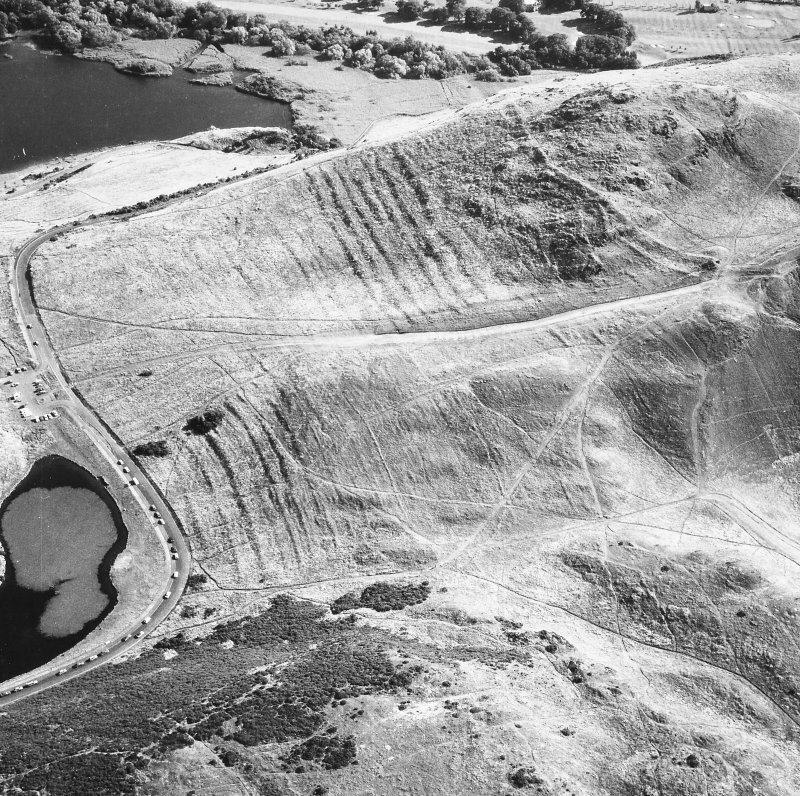 No archaeologically significant artefacts were recovered from the core of the rampart or below this, and the date of its construction remains unknown. 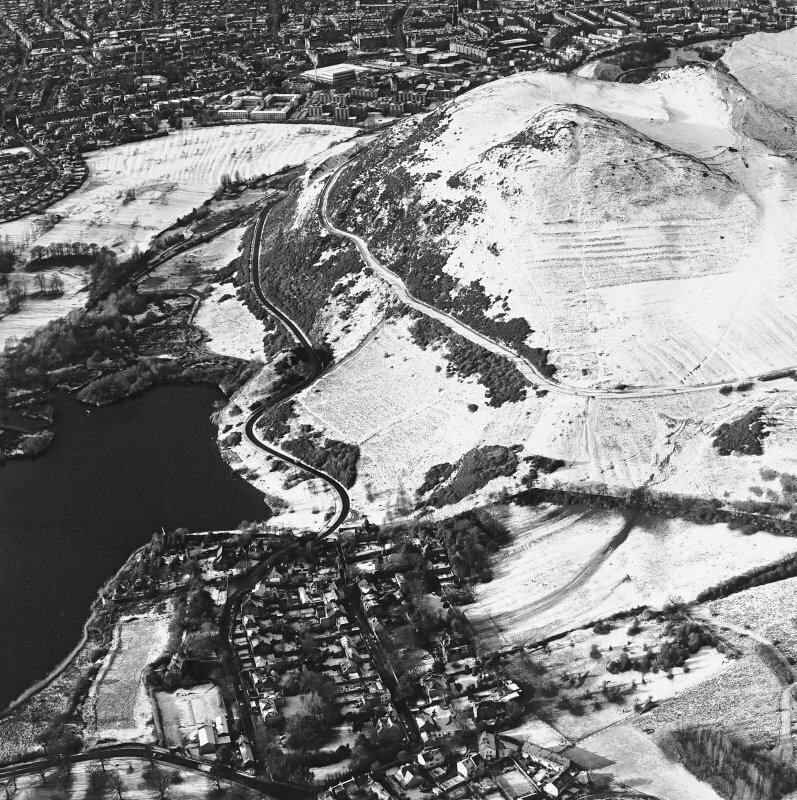 A later dyke, c0.65m wide and one course high, had been built on top of the rampart rubble. 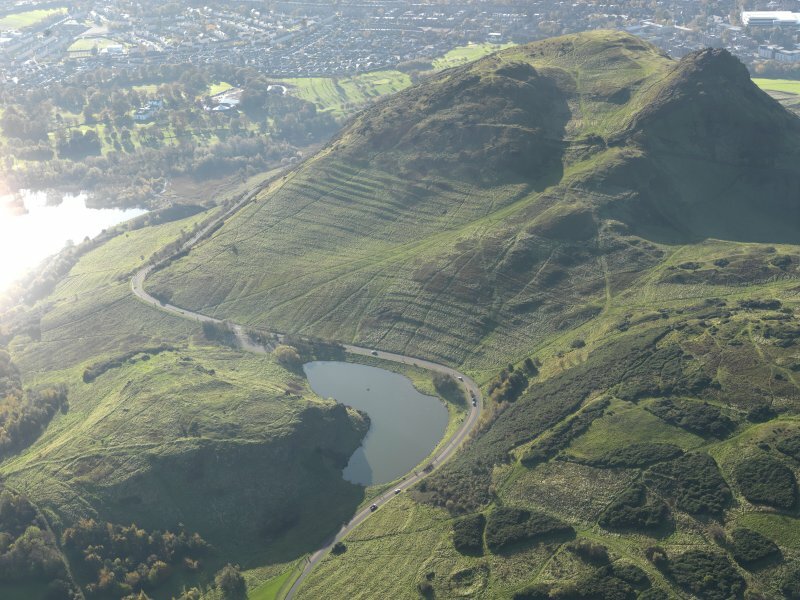 This dyke appears to be part of a rectilinear enclosure, situated in the slight valley between the summits of Arthur's Seat and Crow Hill to the SW, which contains traces of cultivation. 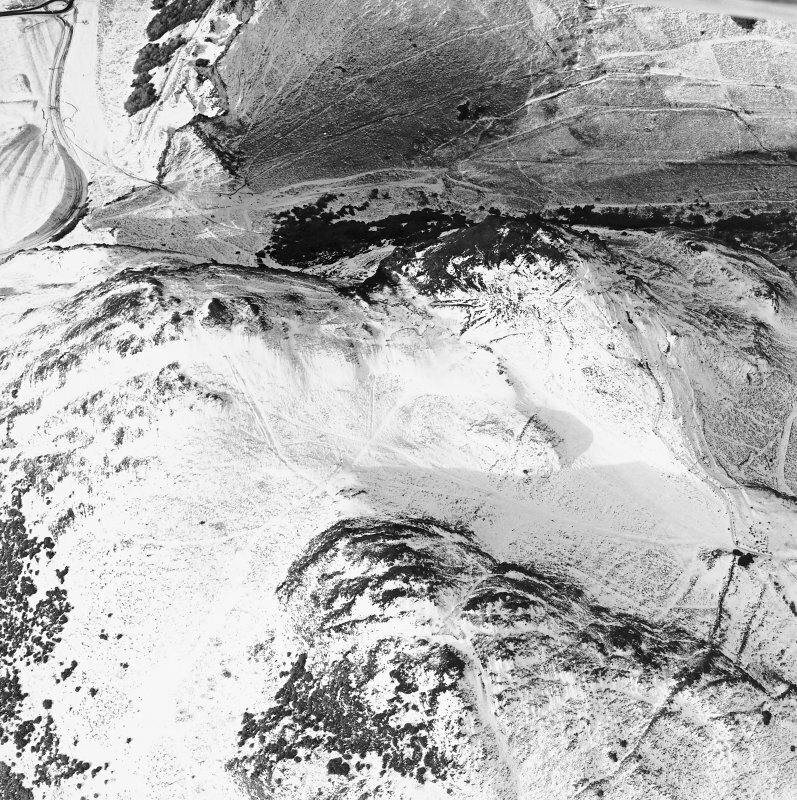 Erosion was apparent along the entire length of the proposed path line. 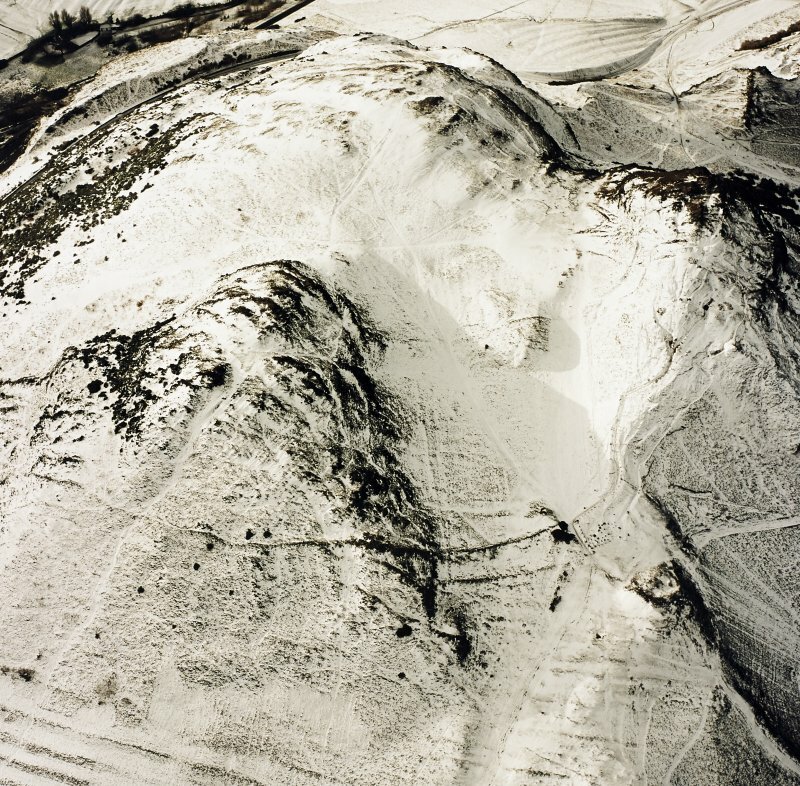 The upper, steeper section had eroded down to bedrock in many places. 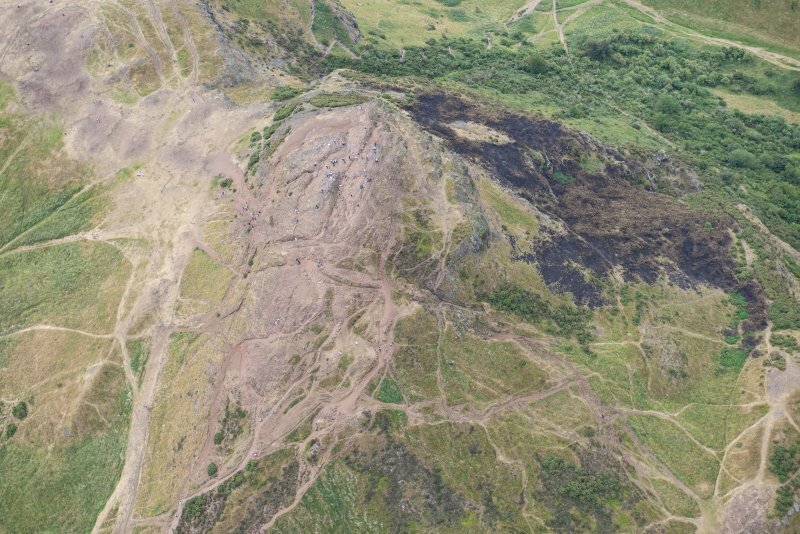 Downslope, however, buried turf lines indicated that this erosion was episodic and artefacts suggested that it had occured in the last 200 years. A full report will be lodged with NMRS. (Location cited as NT 276 729). 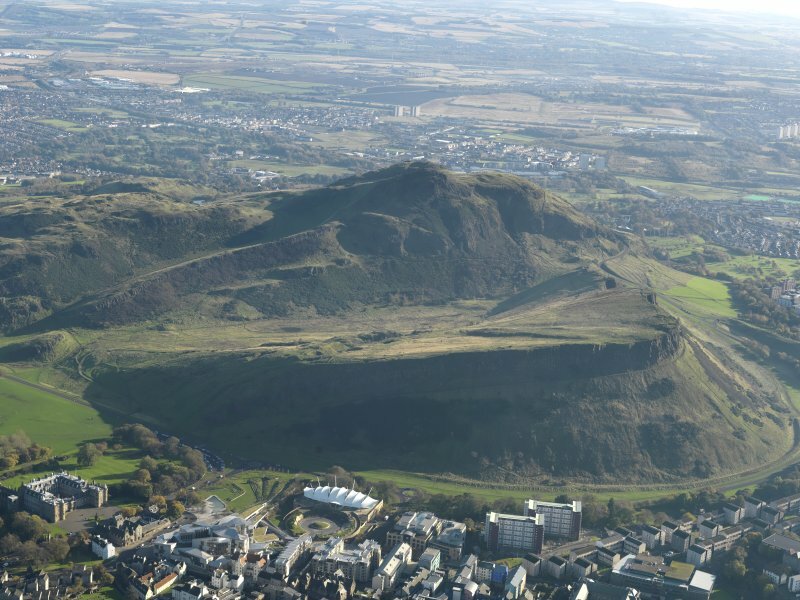 The fort on Arthur's Seat was attributed to the early Historic period by Stevenson on the evidence of its similarity with the outer works at Dalmahoy (NT16NW 1). 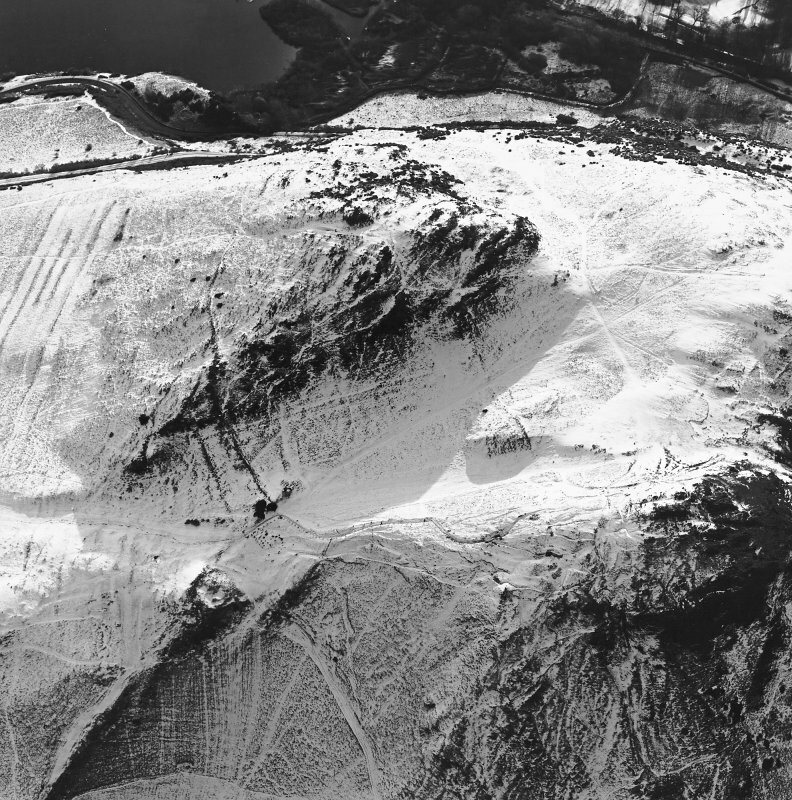 It is defined by two parallel banks cutting off the main [natural] approaches to the summit from the NE; these incorporate several natural outcropping crags and hillocks. 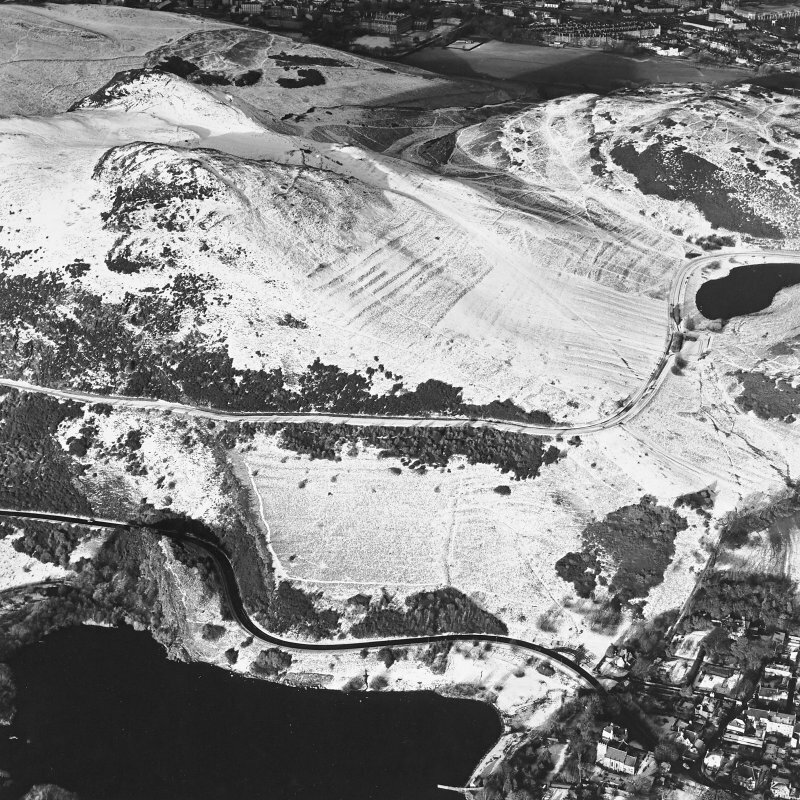 The remainder of the circuit is assumed to have been formed by the natural defences of cliffs, possibly with the addition of slighter walls which no longer survive. 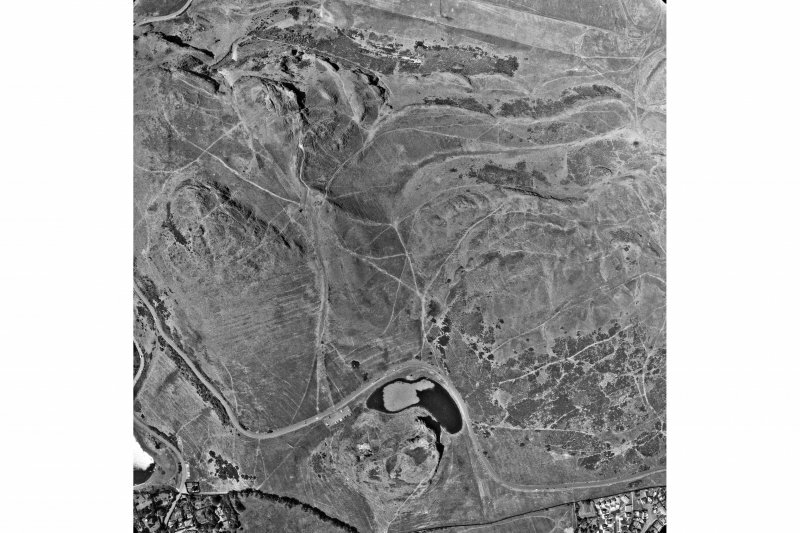 The NW ends of the defensive banks are overlain by a pair of later stone and turf enclosures, the larger of which appears to have enclosed cultivated ground. 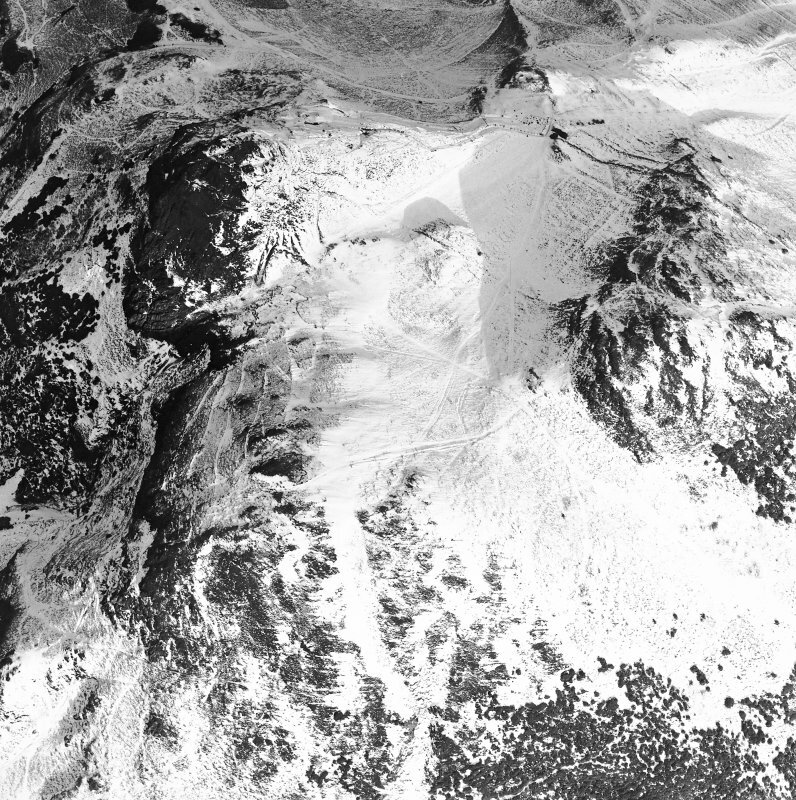 With an enclosed area of about 8ha, the fort falls within Feachem's category of 'minor oppida', a category which awaits systematic study but may be chronologically diagnostic. 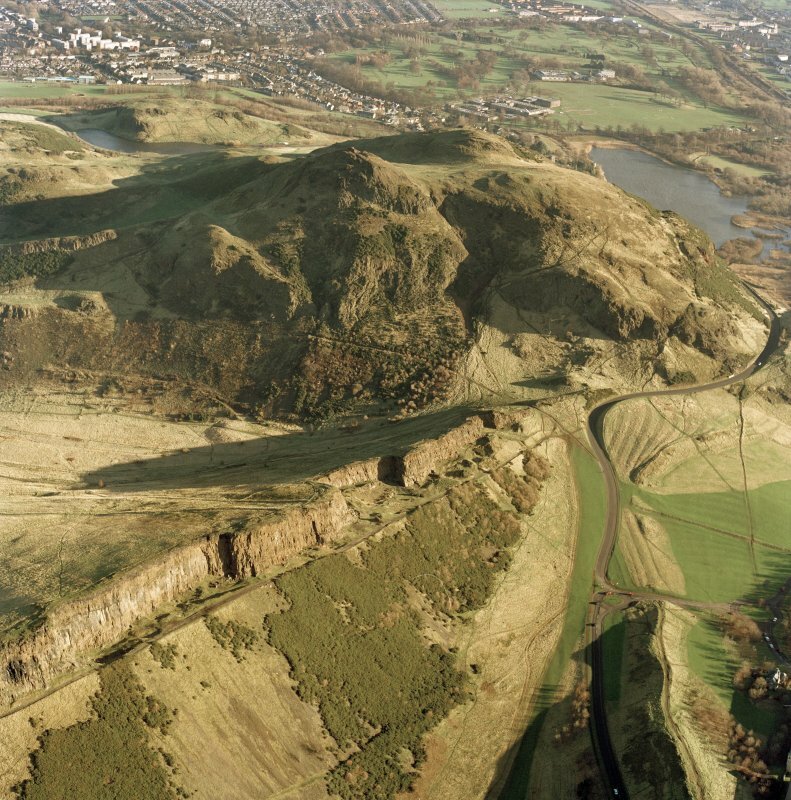 In 1995, visitor erosion of the approaches from the NE was countered by ground consolidation and path construction ('stone-pitching') over an area measuring about 60m by 2m within the putative interior and adjacent to the NW terminus of the inner bank. 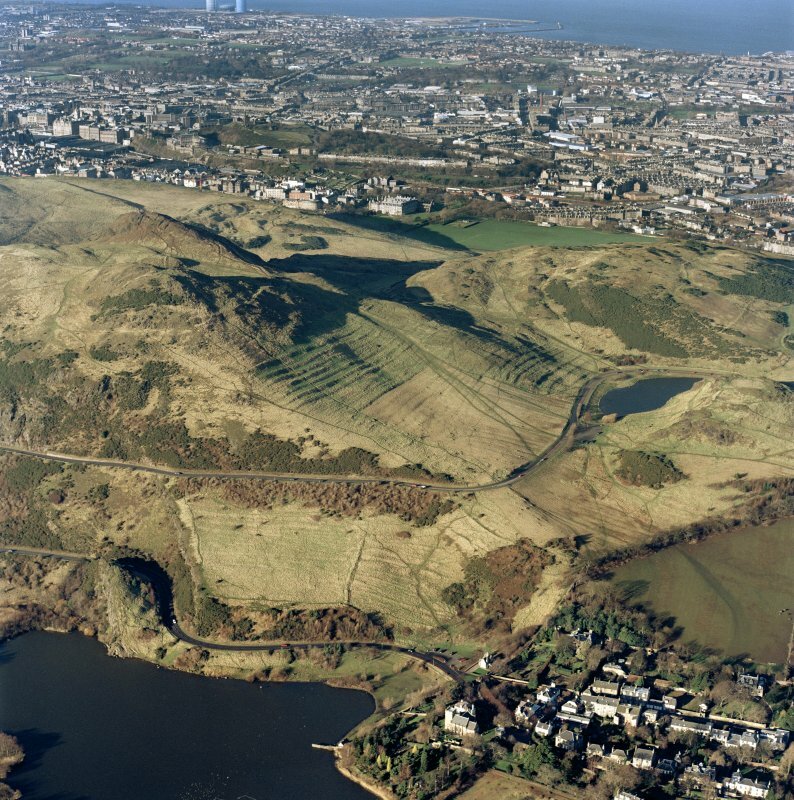 Preliminary survey was carried out (by M Collard for City of Edinburgh District Council Archaeology Service) and excavation (in January 1995) by [Edinburgh University] Centre for Field Archaeology. 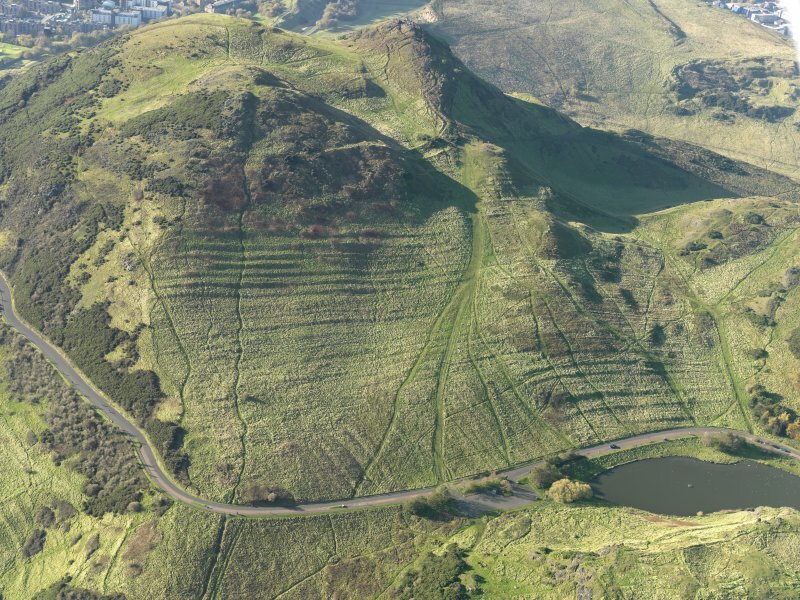 Seven trenches were excavated along the line of the path and an eighth through the inner rampart; deeper local cuttings were excavated within three of the former. 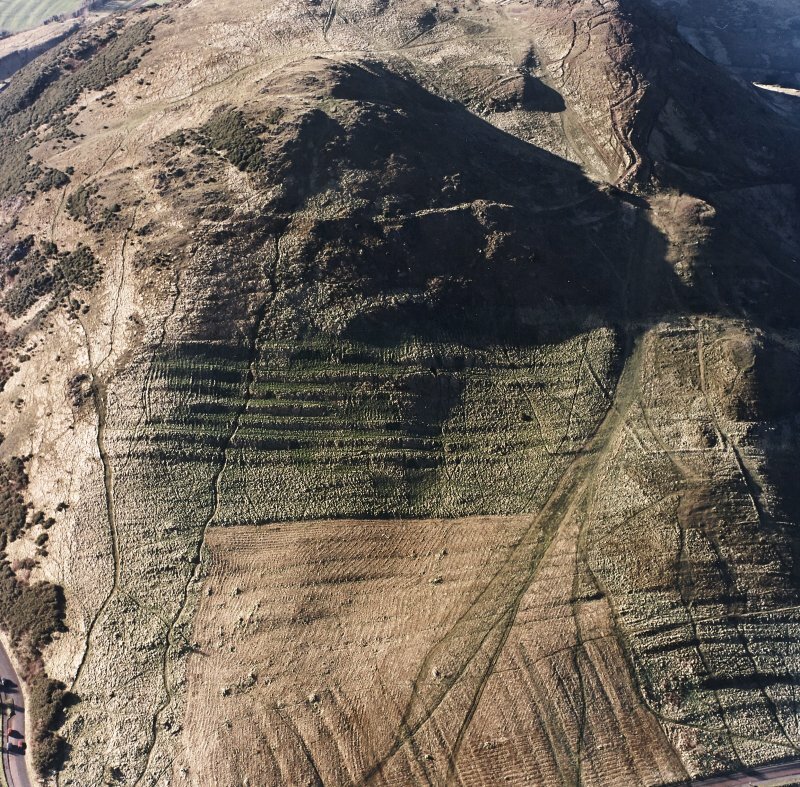 Features uncovered included a large spread of rampart rubble, the possible collapsed outer face of a rampart, later stone dykes, and modern erosion deposits. All the artifacts recovered were of modern origin. 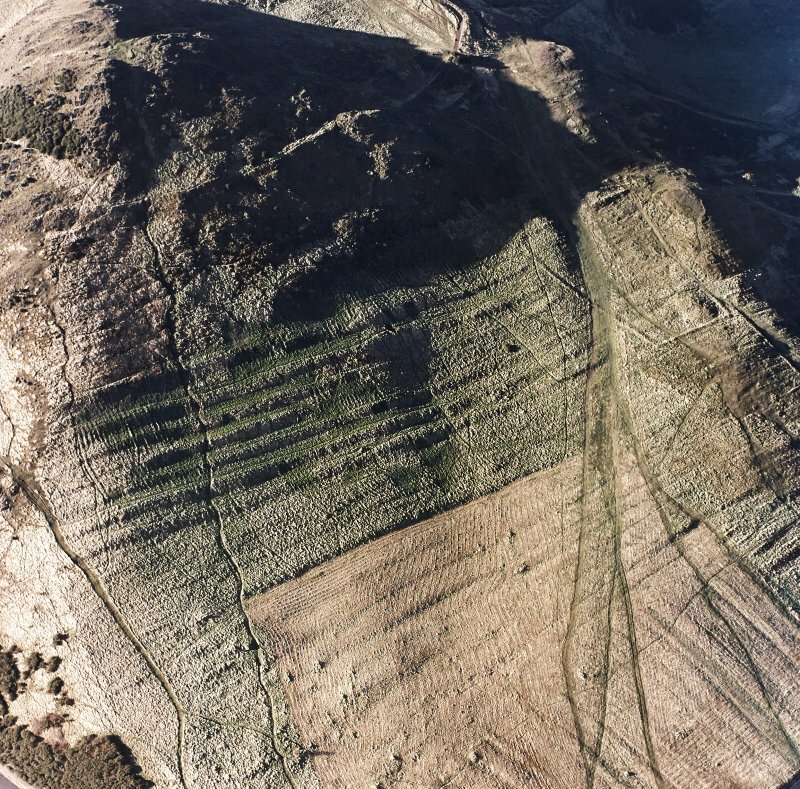 The terraced rampart measured at least 5.4m in thickness by up to 1.2m in height, and was comparable with the later terrace rampart at Traprain Law (NT57SE 1.00); the possible collapsed wall face was distinguished by the presence of stones larger than those found in the core. 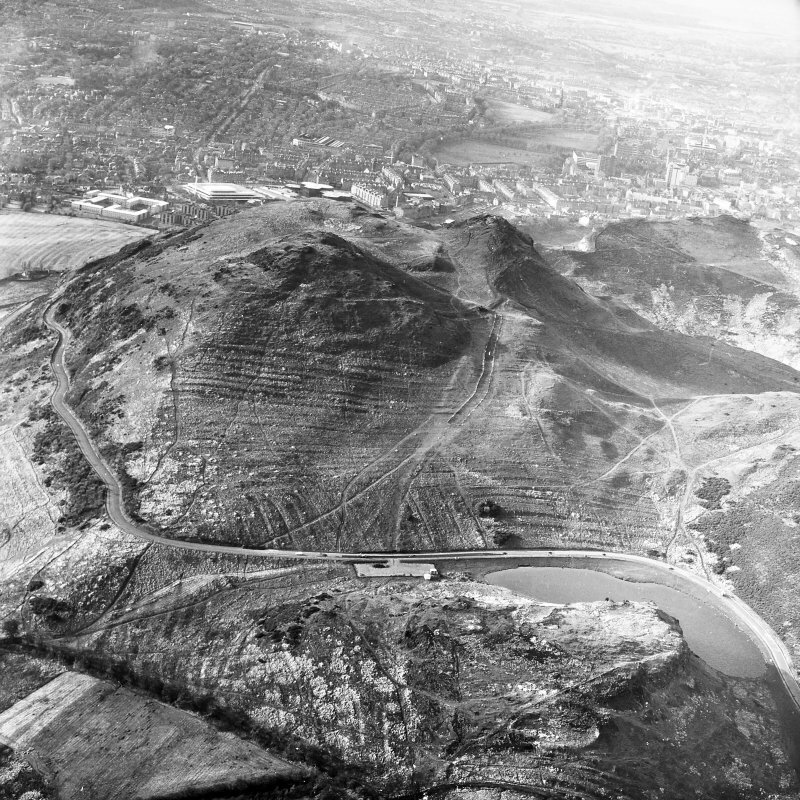 Excavation also confirmed Stevenson's interpretation of the faced dyke on the summit of the rampart mound as a later addition. 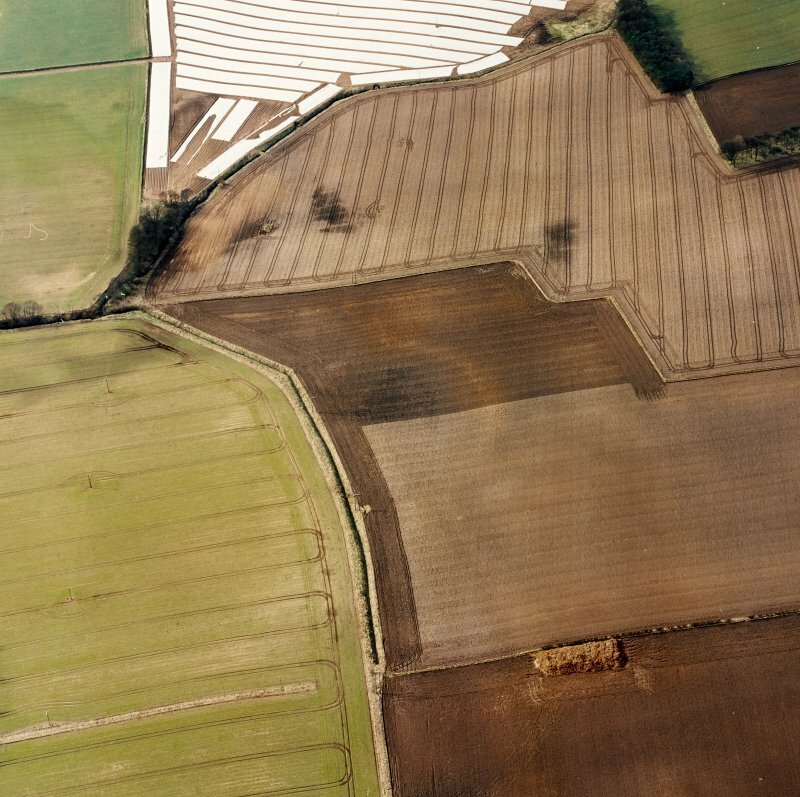 It probably relates to the area of cultivation and the rectangular enclosures, which were noted as 'old fences' on the OS map of 1881. 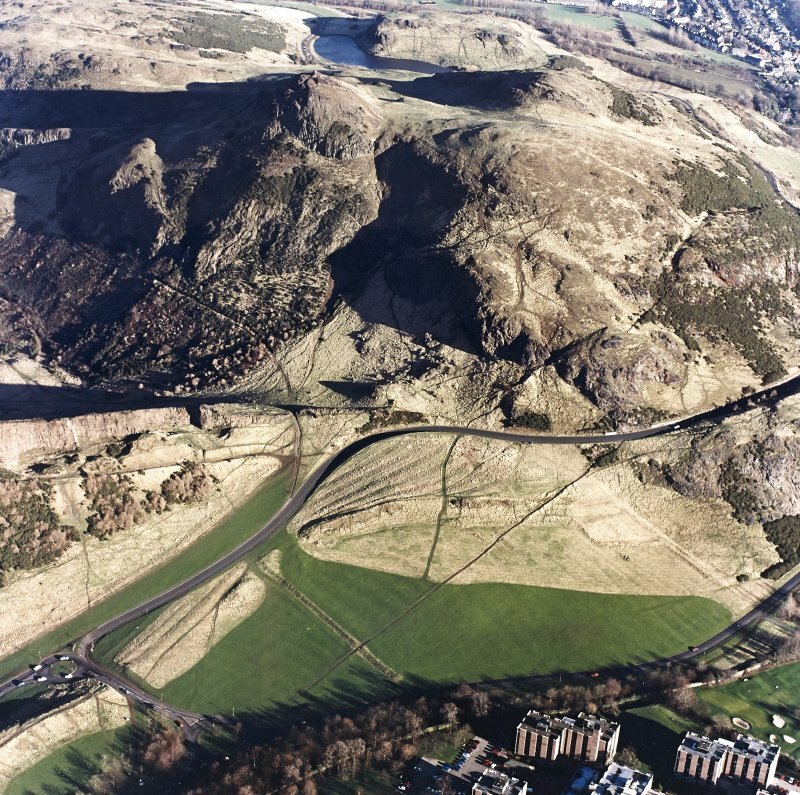 This fort encloses an area some 8.4ha in extent and is defended on the E by two roughly parallel ruinous stone ramparts that extend along the boulder-strewn slope below the summit of Crow Hill. 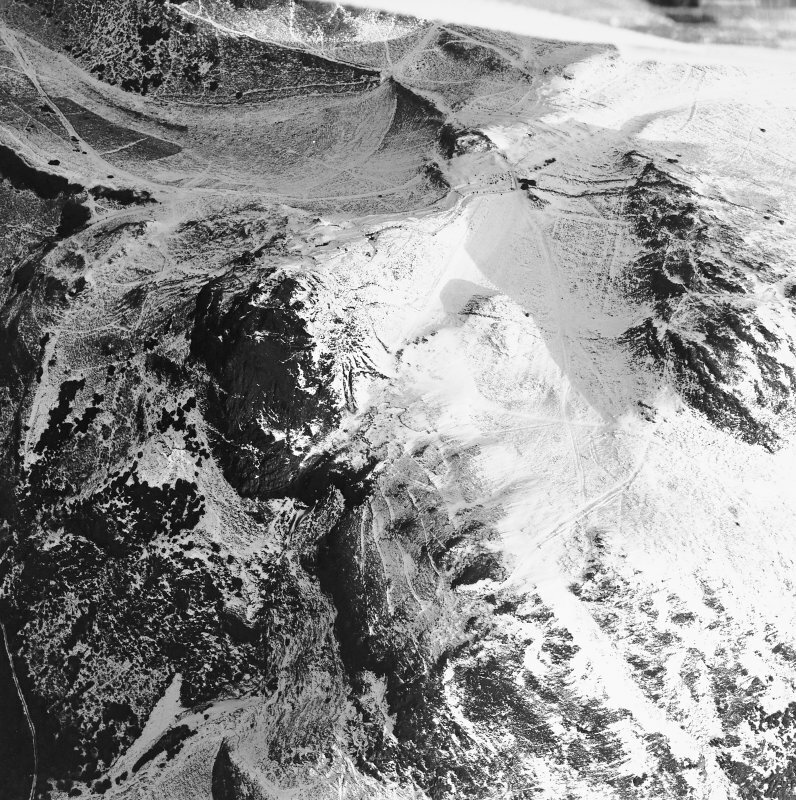 This approach from the E is by far the most gentle, and there is no trace of any man-made defence on the steep and rocky slopes elsewhere. 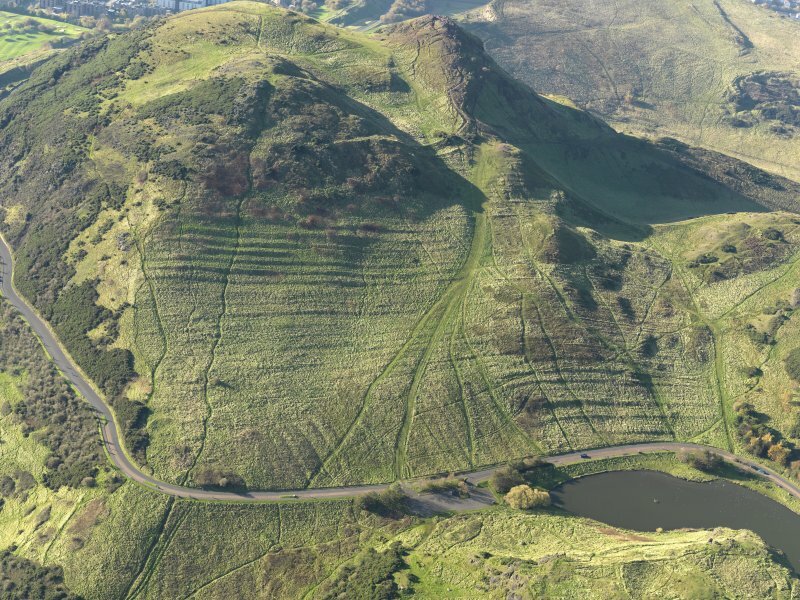 The upper rampart is the better preserved, surviving as a stony bank spread up to 4.3m in thickness, and can be followed from rock outcrop on the S to the saddle between the summits of Arthur's Seat and Crow Hill (NT 2780 7279 to NT 2770 7298). 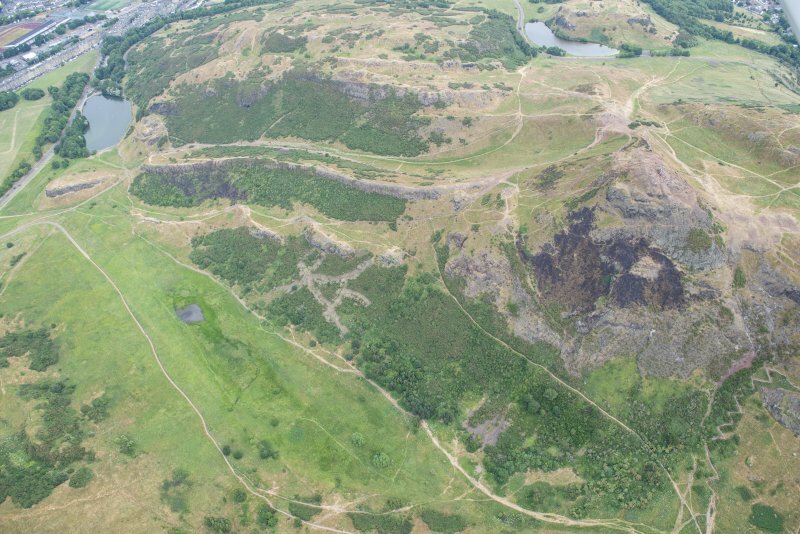 For much of its length, the lower rampart can be traced as a narrow terrace up to 3m broad, petering out at its NW end, where it appears to swing N to enclose a small knoll (NT 2781 7279 to NT 2771 7299). Both ramparts have been incorporated into the NE end of a later enclosure (NT27SE 3959) that occupies much of the saddle in the interior of the fort. 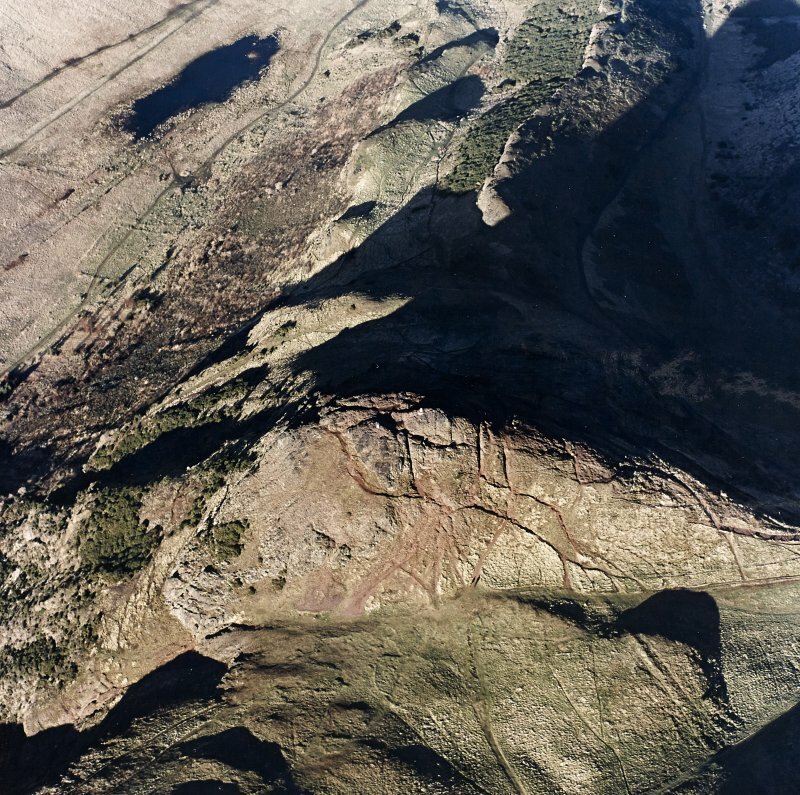 On the edge of this saddle, underlying the SE side of the enclosure, there are faint traces of a possible circular house measuring 8.2m in overall diameter. 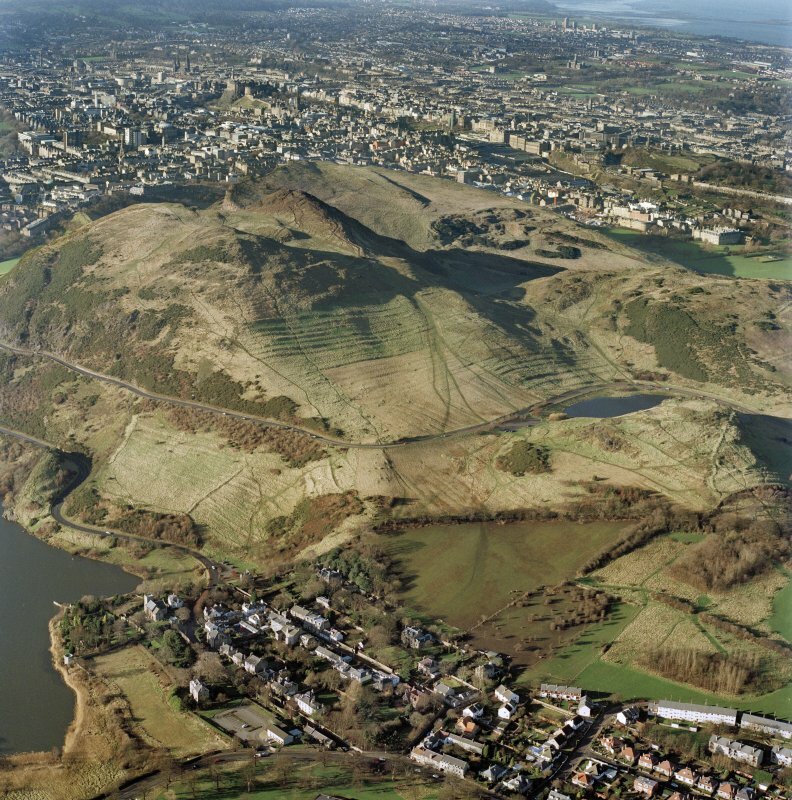 The defences and circular house are plotted at 1:5,550 on an archaeological map of Holyrood Park (RCAHMS 1999). 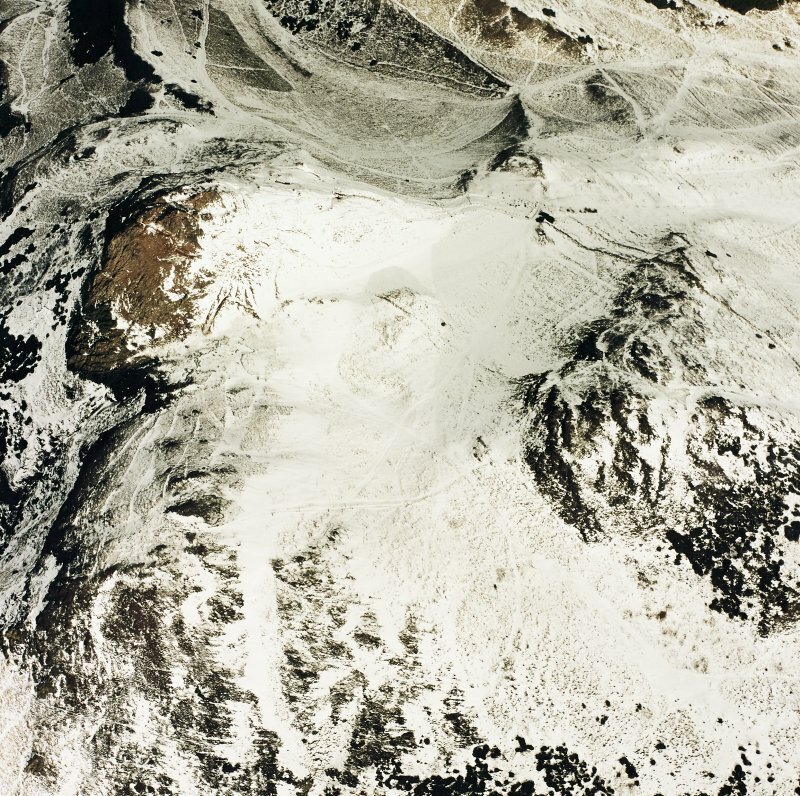 Visited by RCAHMS (ARG), 15 December 1998. NMRS, MS/726/96 (38-9, no. 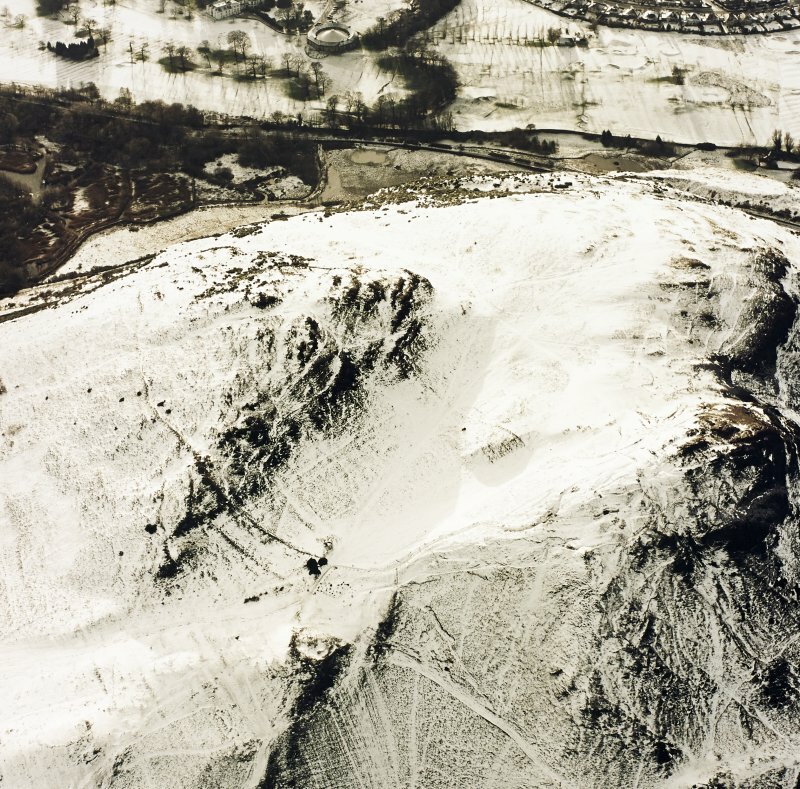 13); RCAHMS 1999. 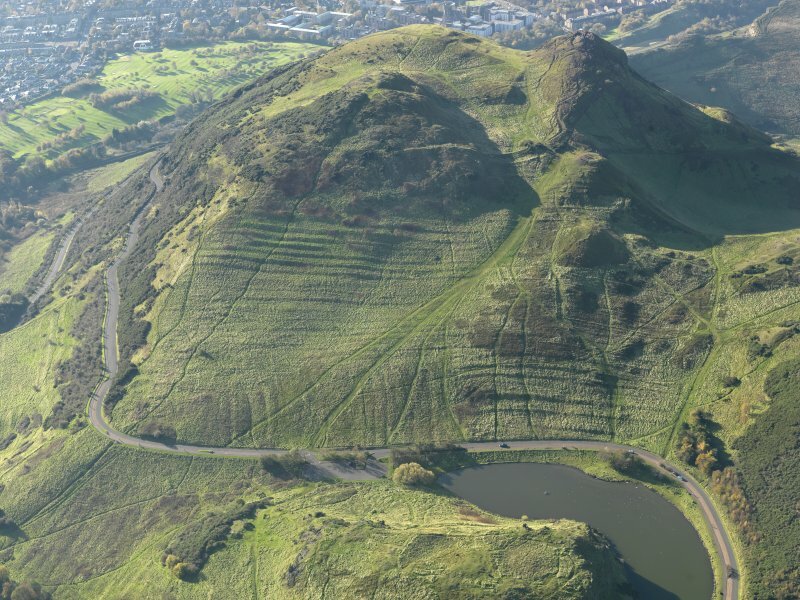 Arthur's Seat, the steep and craggy hill at the core of Holyrood Park in Edinburgh, is apparently the site of a large fort, though defences have only been been identified barring access to its upper slopes on the E, principally blocking access up a broad gully into the saddle between the summit on the NW and Crow Hill on the SE, and extending across the E face of Crow Hill above the system of cultivation terraces. 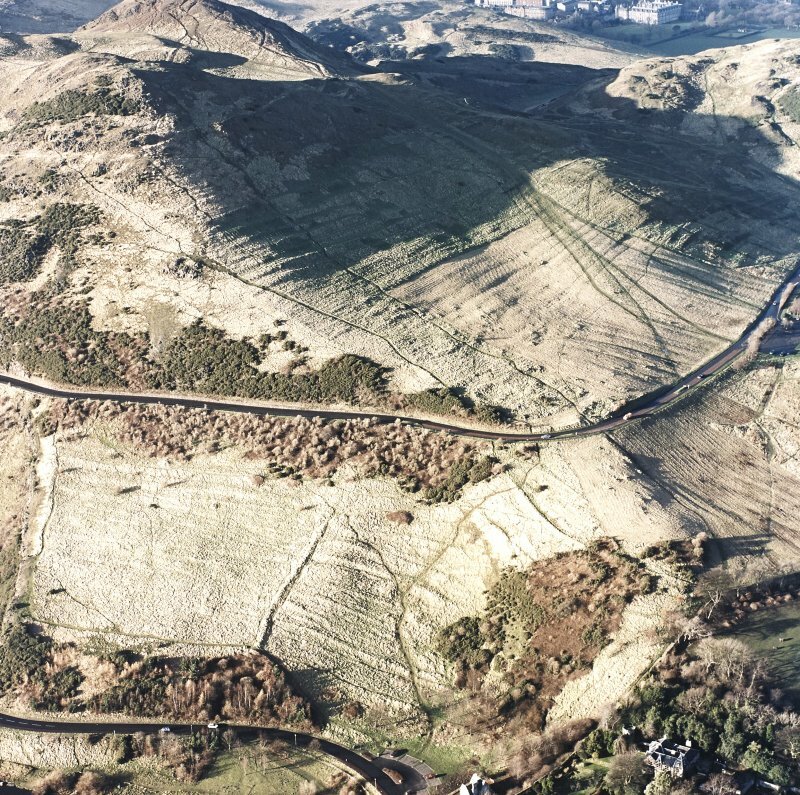 The other flanks, which are steep but by no means inaccessible, were apparently left open and the size of the interior can be only roughly estimated at some 8.5ha. 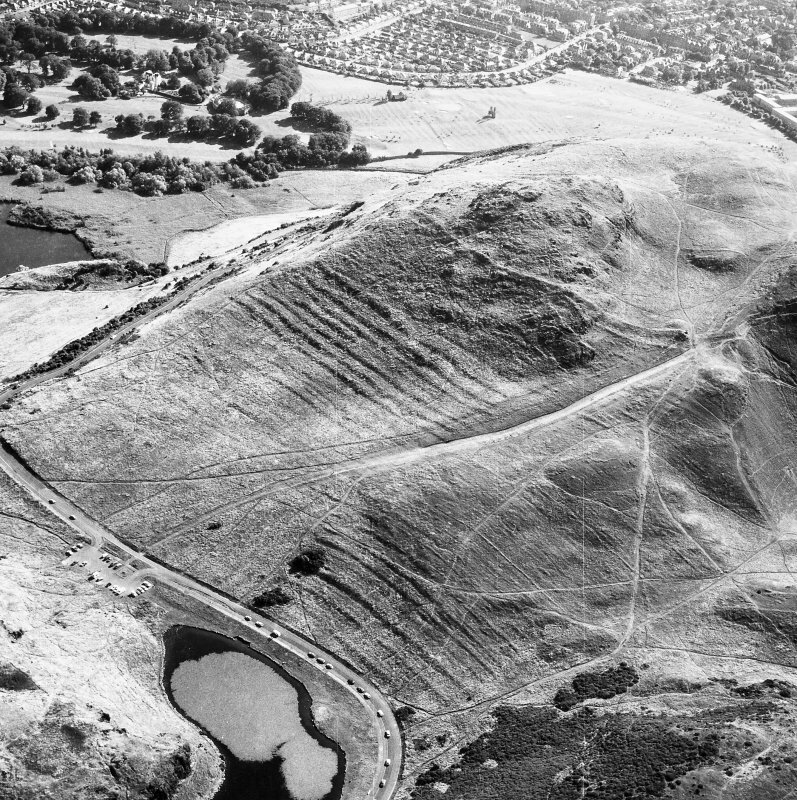 The defences comprise two ramparts, which on the floor of the gully both form substantial terraces overlain by later field-banks, and there is a possible entrance at the foot of a hillock on its NW side. 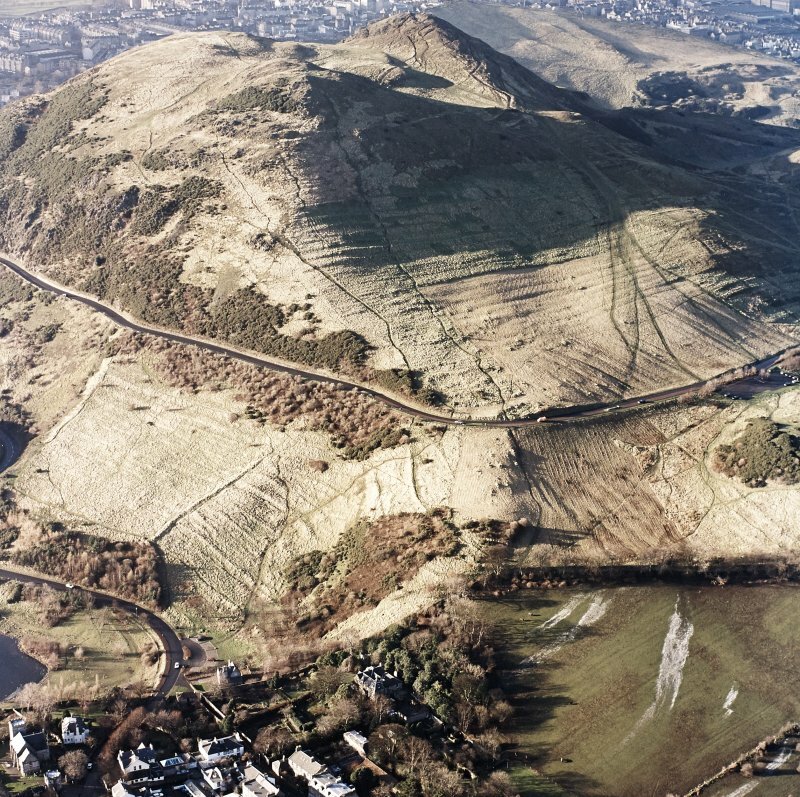 In 1995 excavation along the line of the footpath to the summit of Arthur's Seat uncovered a band of rubble belonging to the inner extending NW from the hillock to the lip of the slope, while a section cut across its line on the hillock revealed that it was spread at least 5.4m in thickness by up to 1.2m in height (Alexander 1997). 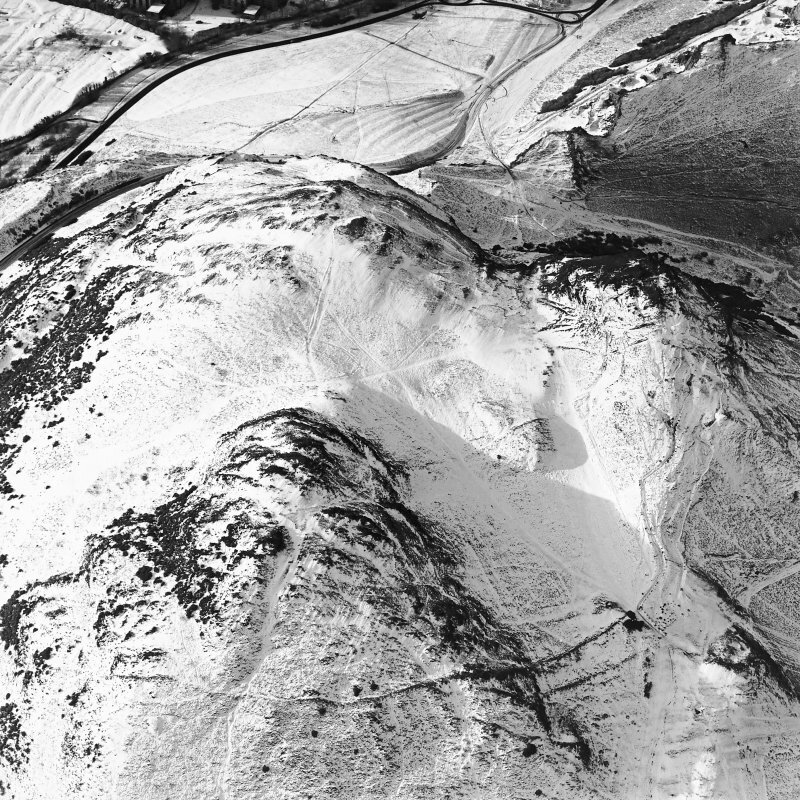 A possible round-house has been tentatively identified on the SE side of the gully a short distance up the slope from the inner ramaprt, but in view of the general absence of such features from the rest of the interior this feature is perhaps unrelated to the use and occupation of the fort.